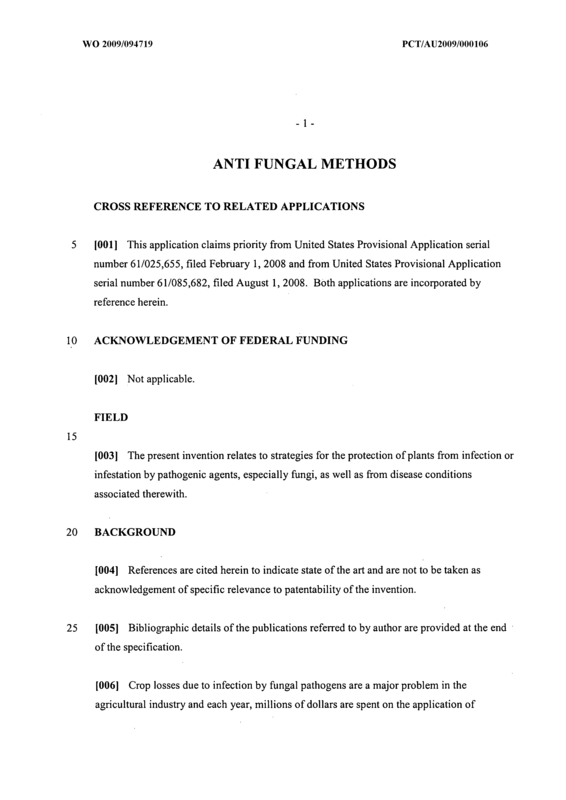 A system for reducing the incidence or severity of fungal infection of a plant, comprising a chemical fungicide component, which may be provided by foliar or root (soil or liquid nutrient) application, together with an antifungal plant defensin not in nature expressed in the plant being protected or expressed in lower amounts or in different tissues, provides synergistic improvement in protection against infection by a plant pathogenic fungus which is susceptible to the defensin and the fungicide. 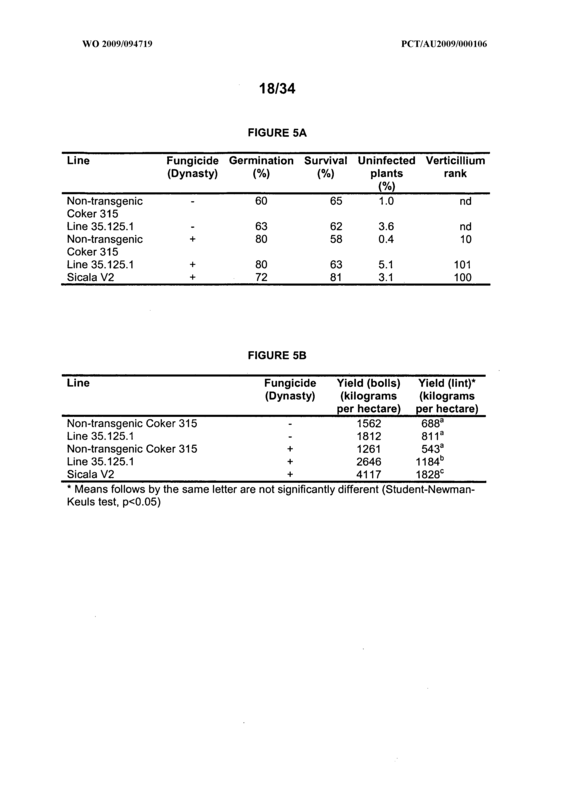 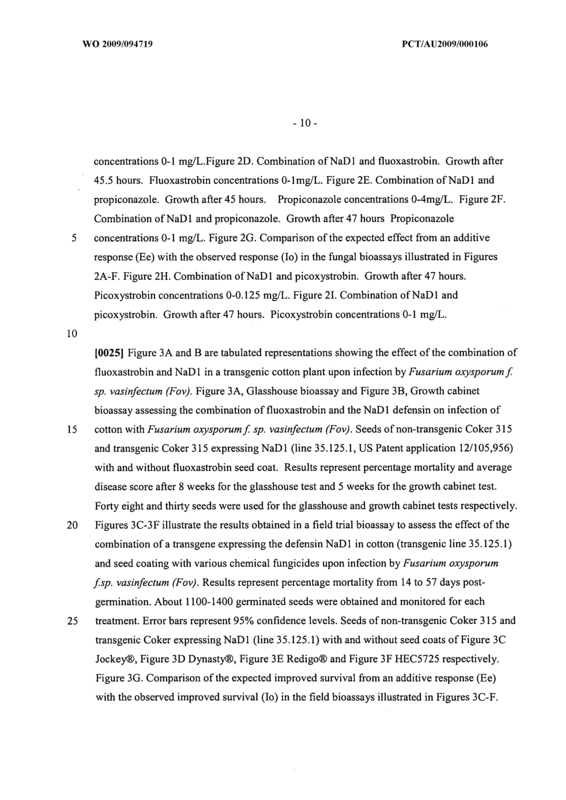 The fungicide can be a strobilurin or a triazole, and the defensin can be selected from a wide range of known defensins, for example, NaD1 and others, or it can be a chimeric defensin engineered for low toxicity to the plant. 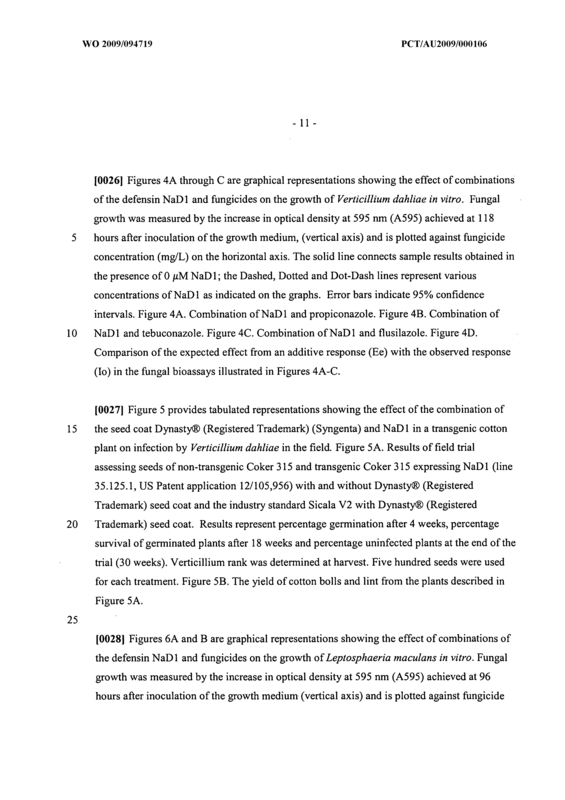 The defensin can be provided as a protein formulation, optionally together with the fungicide, or it can be provided by recombinant expression in the plant to be protected from fungal infection. 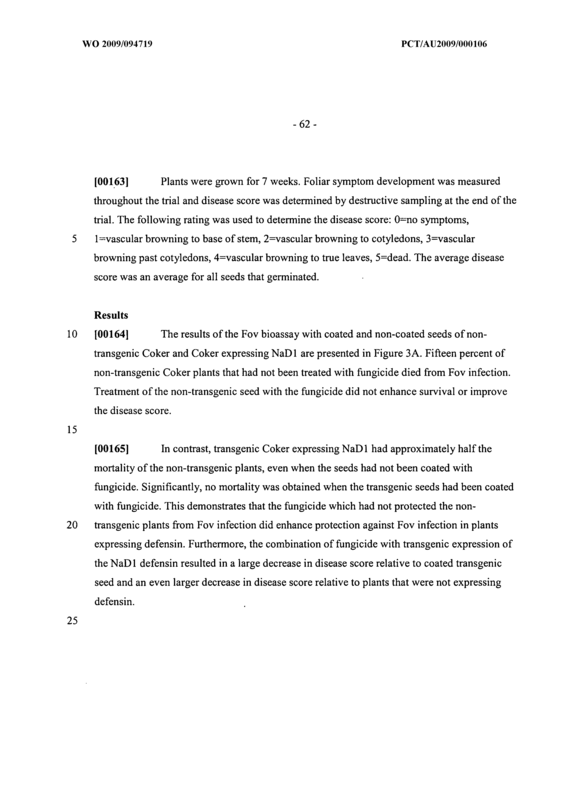 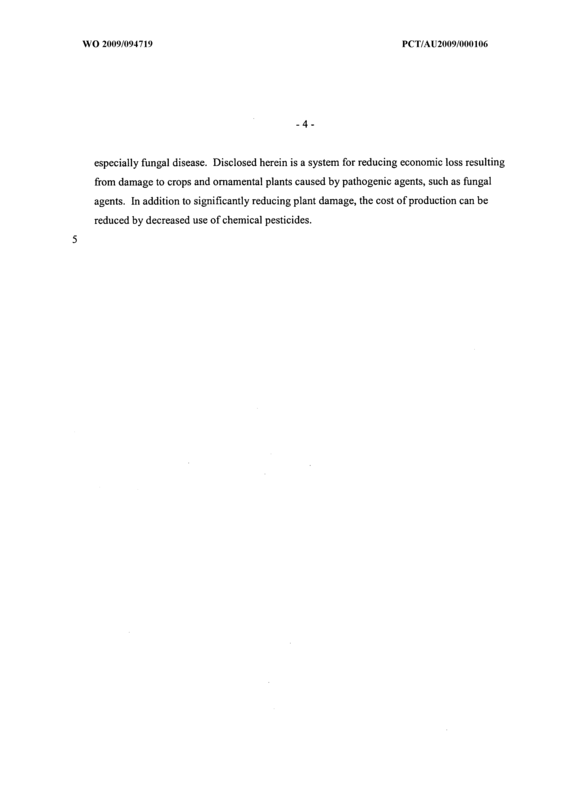 A system for protecting a plant from a disease caused by a given susceptible fungus, comprising a first component and a second component, each of said first and second components being an inhibitor of a given susceptible fungus, the first component being a plant defensin which is not in nature expressed by said plant, the second component being a chemical fungicide, the defensin and the fungicide in combination being synergistic with respect to inhibition of the fungus when combined in contact with the fungus. 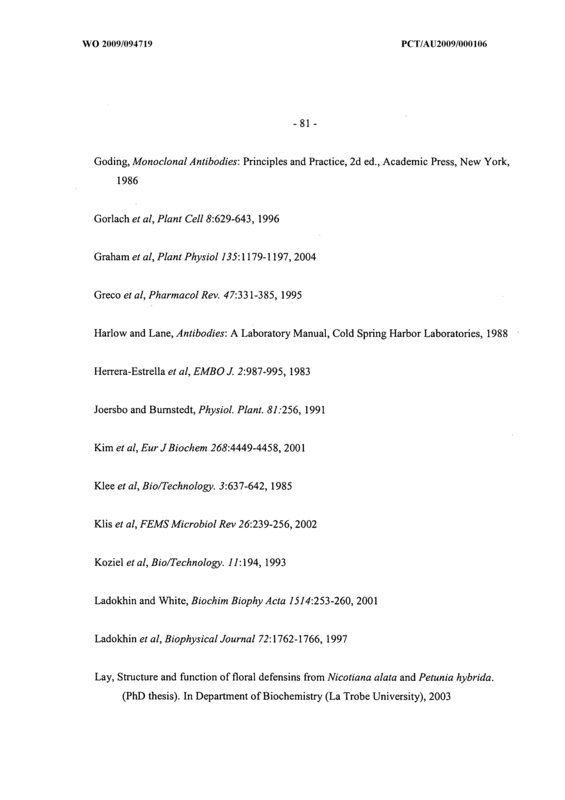 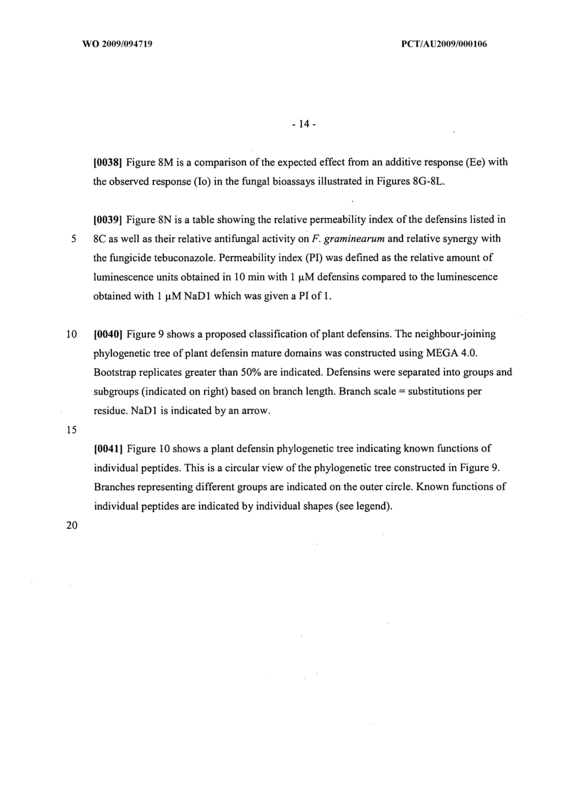 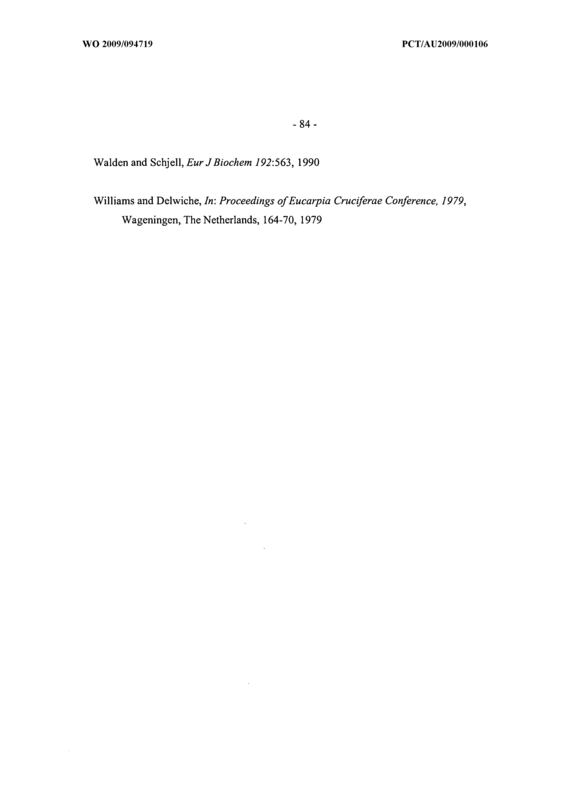 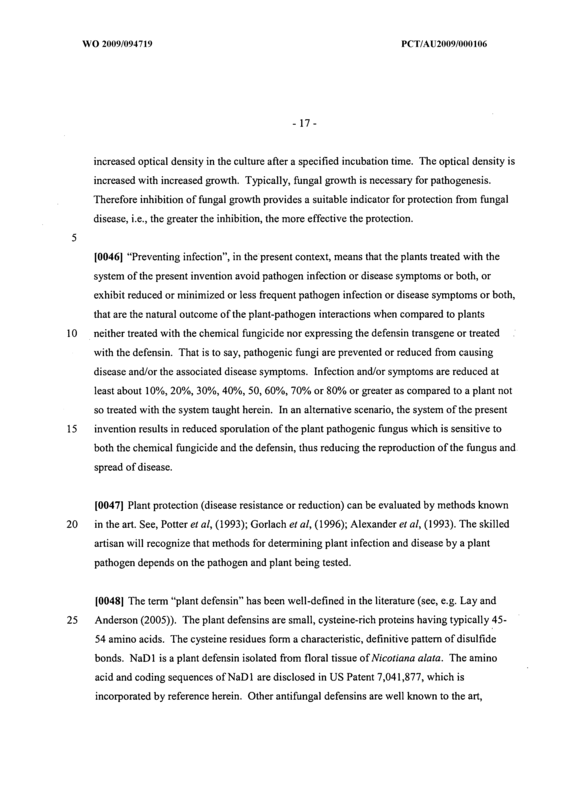 The system of Claim 1 , wherein the defensin is a floral defensin. 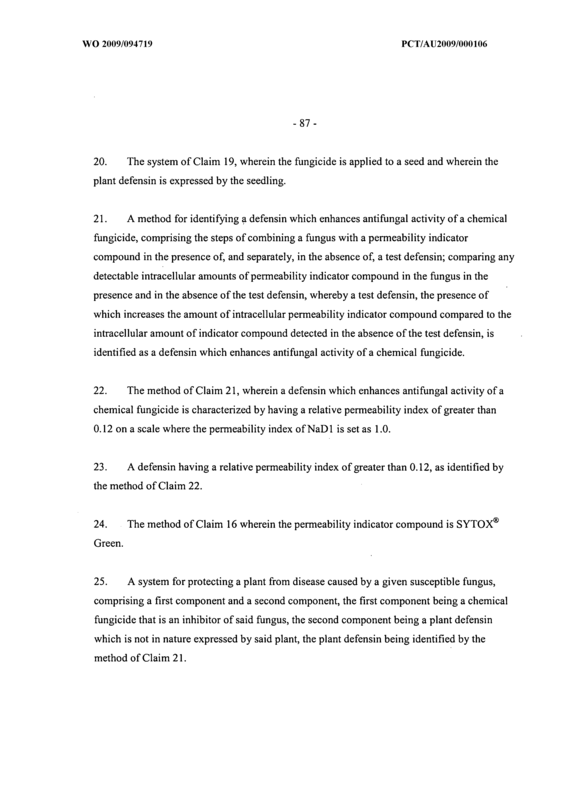 The system of Claim 1 , wherein the defensin exhibits a relative permeability index of greater than 0.12 in contact with the susceptible fungus. 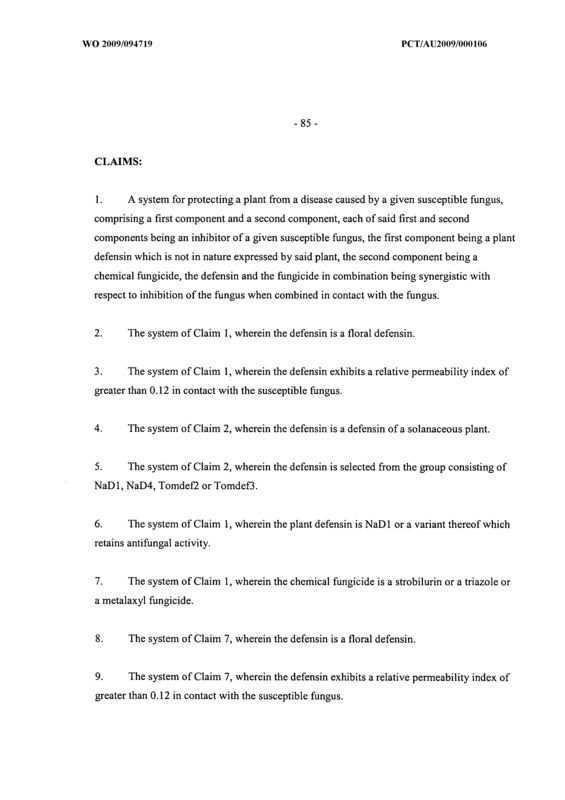 The system of Claim 2, wherein the defensin is a defensin of a solanaceous plant. 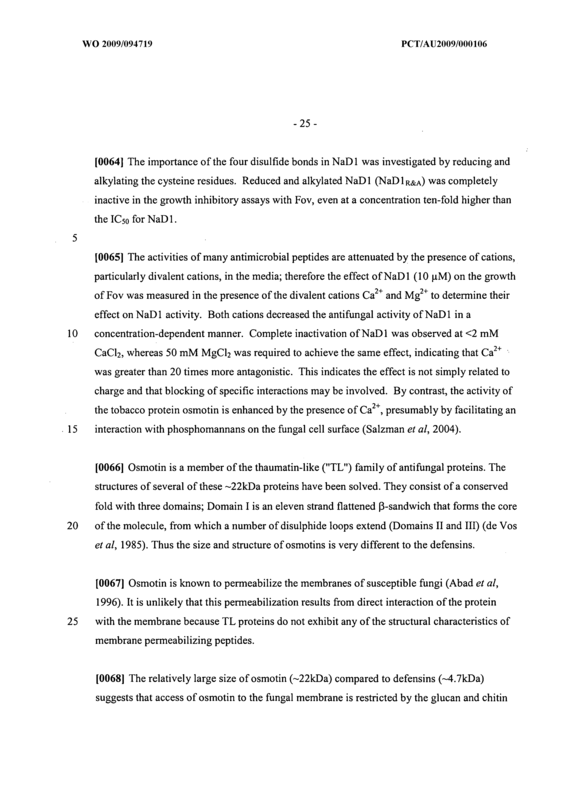 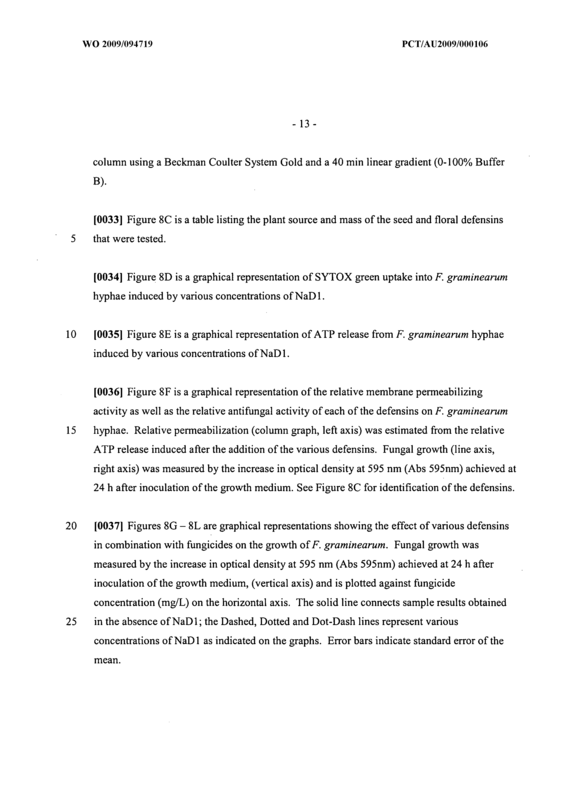 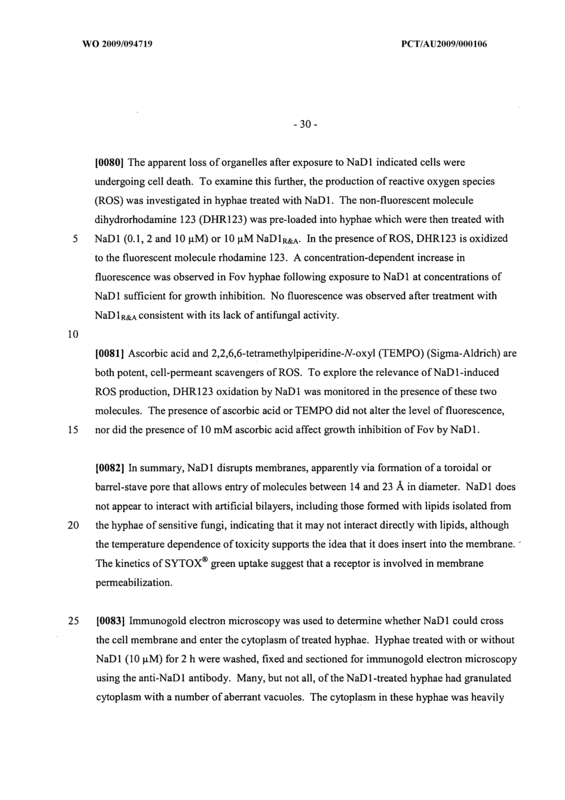 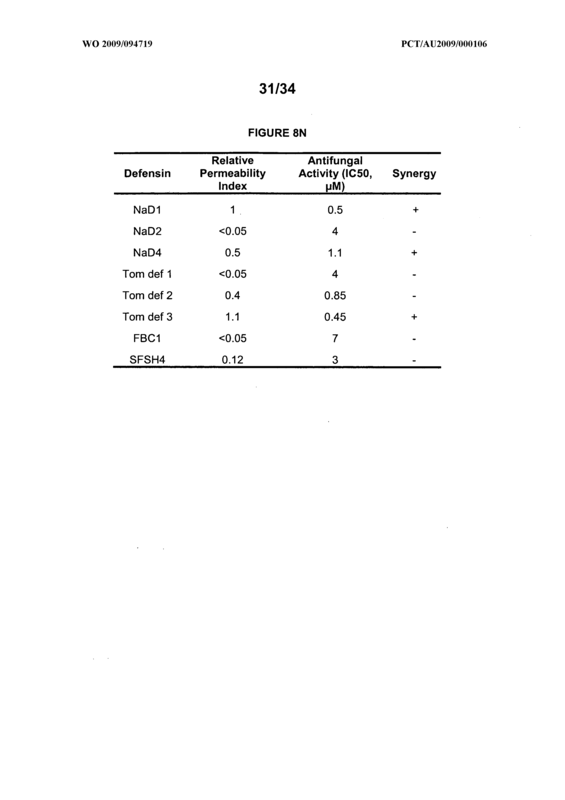 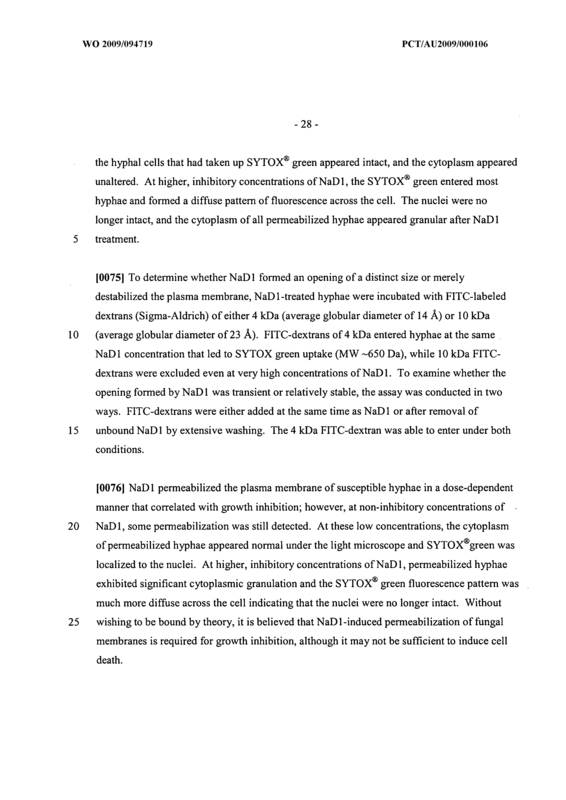 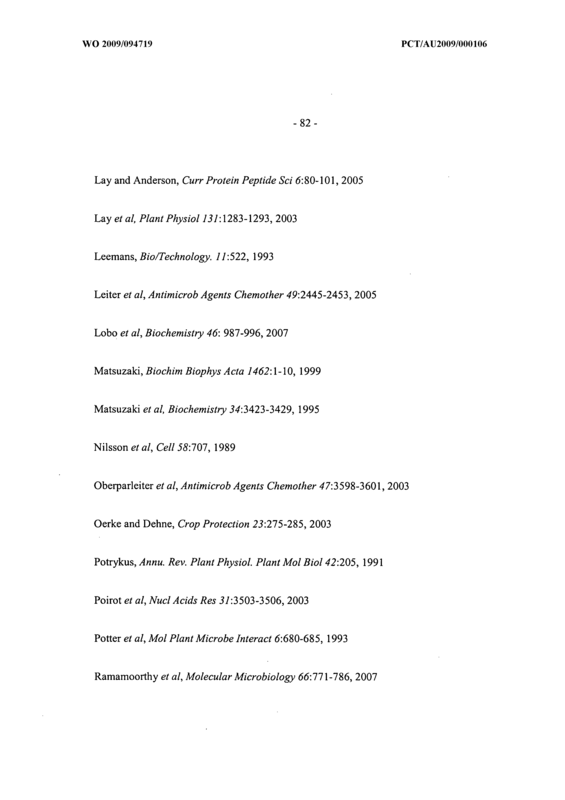 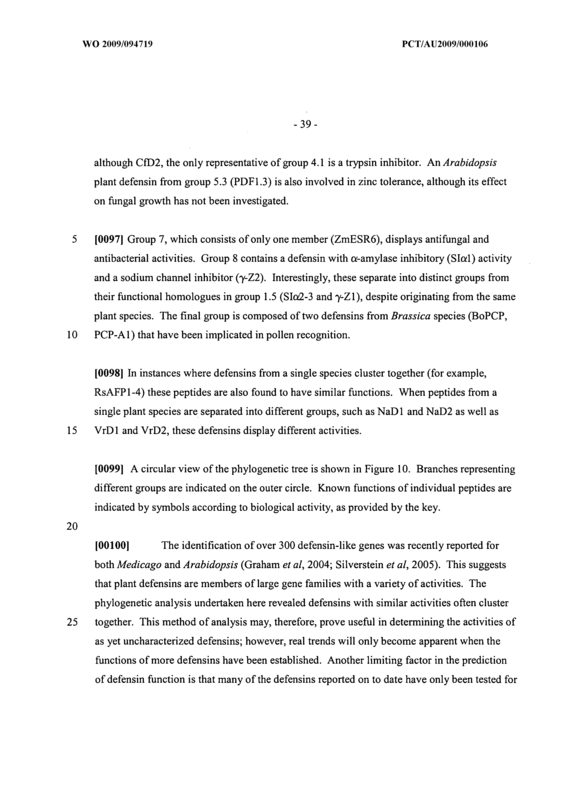 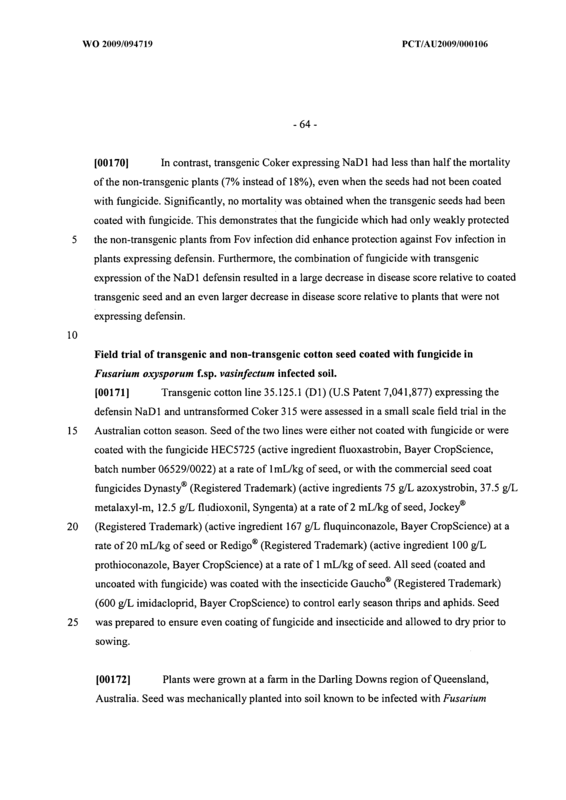 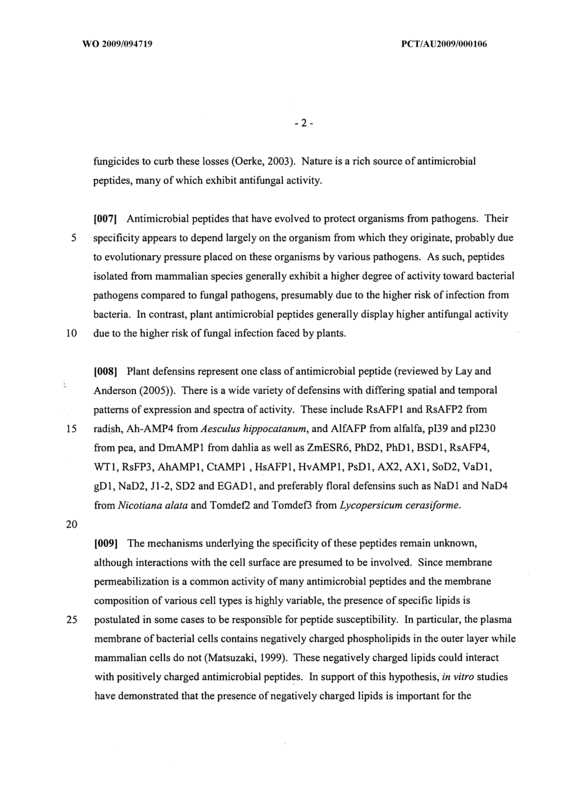 The system of Claim 2, wherein the defensin is selected from the group consisting of NaDl, NaD4, TomdeG or TomdeB. 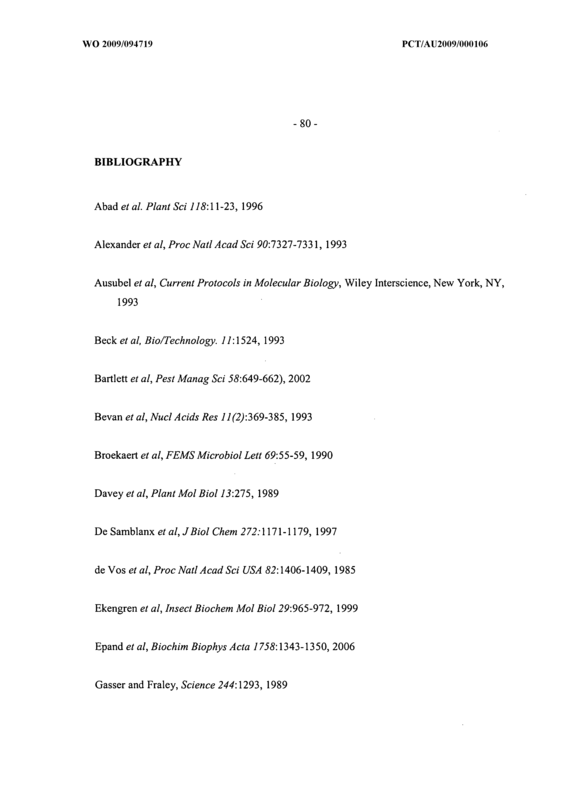 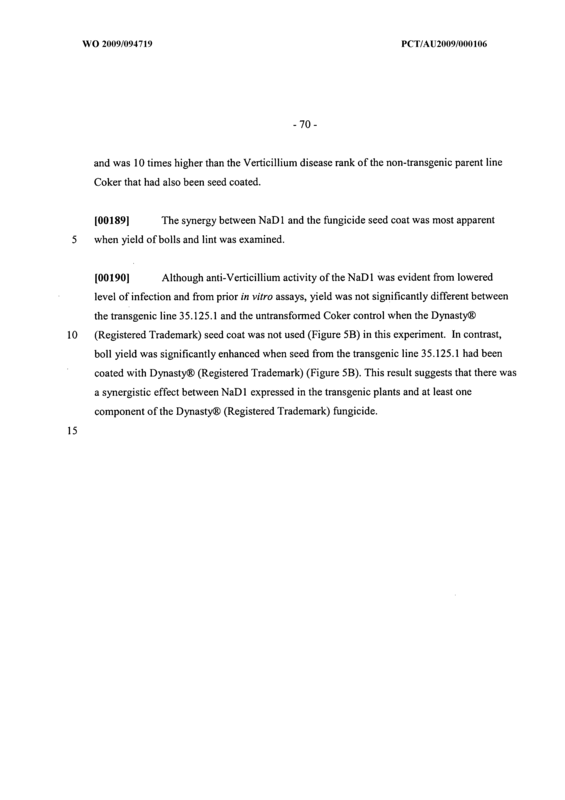 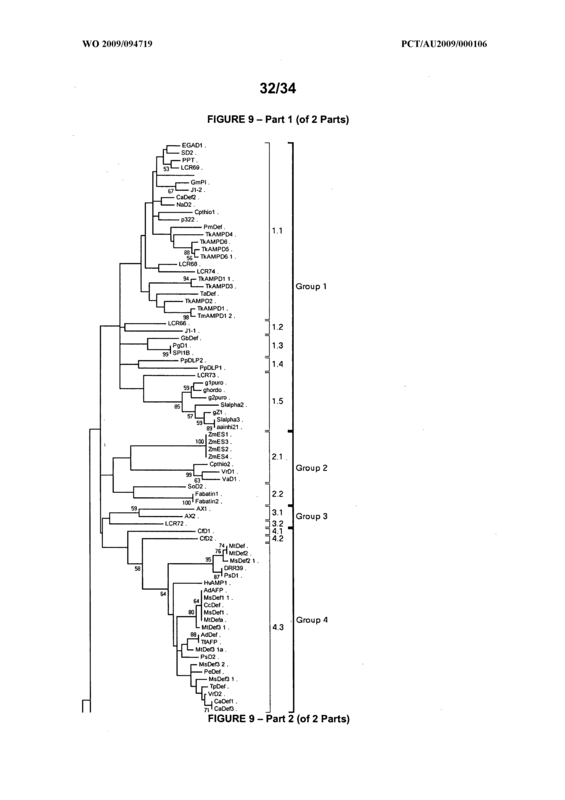 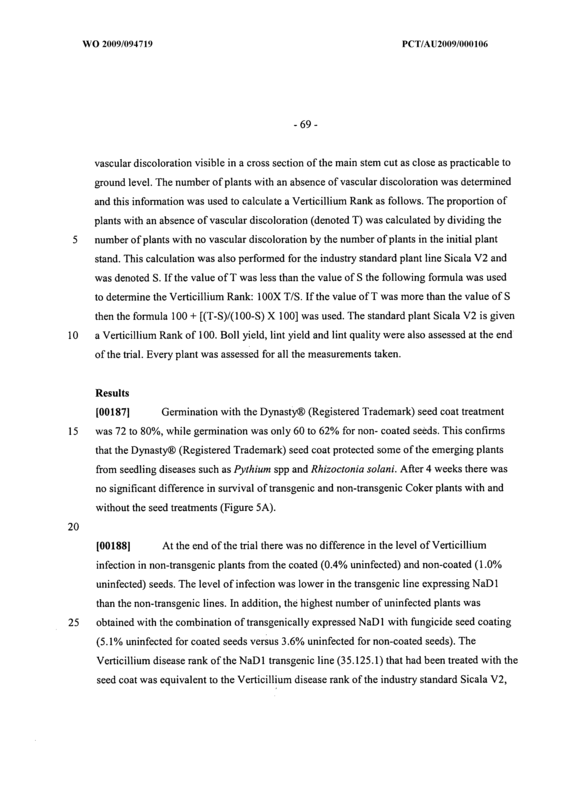 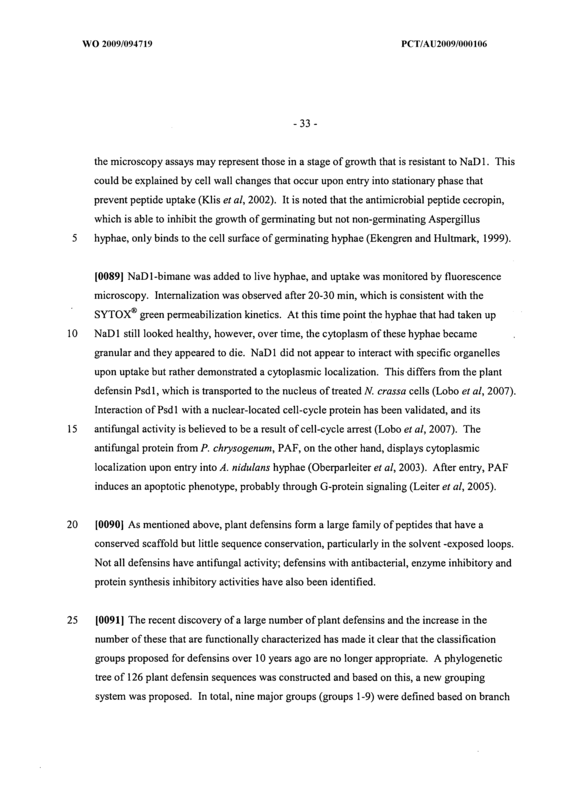 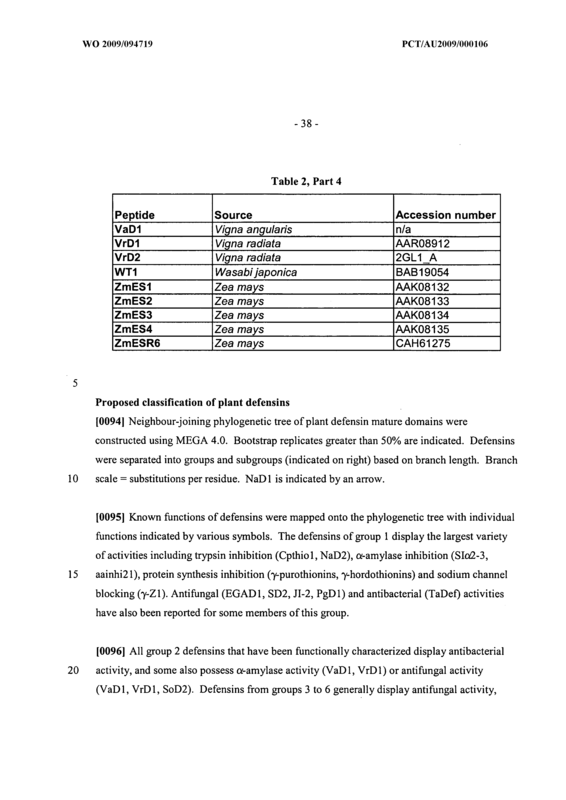 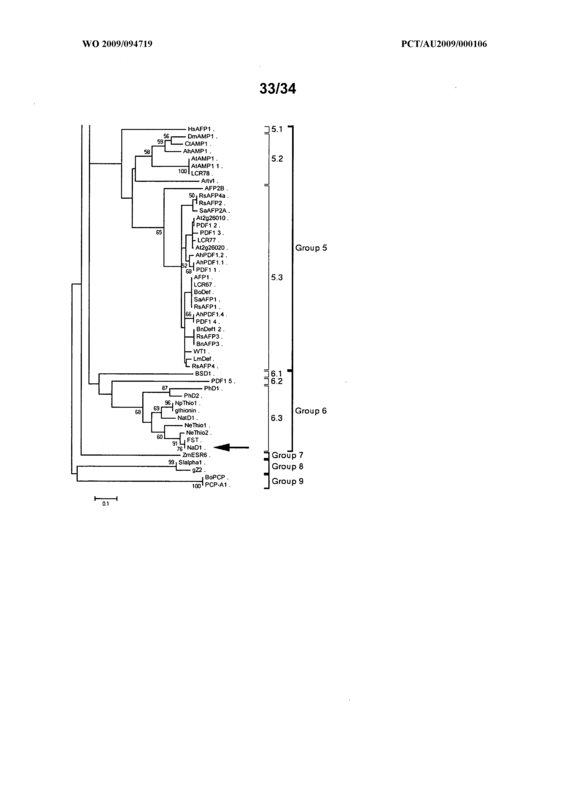 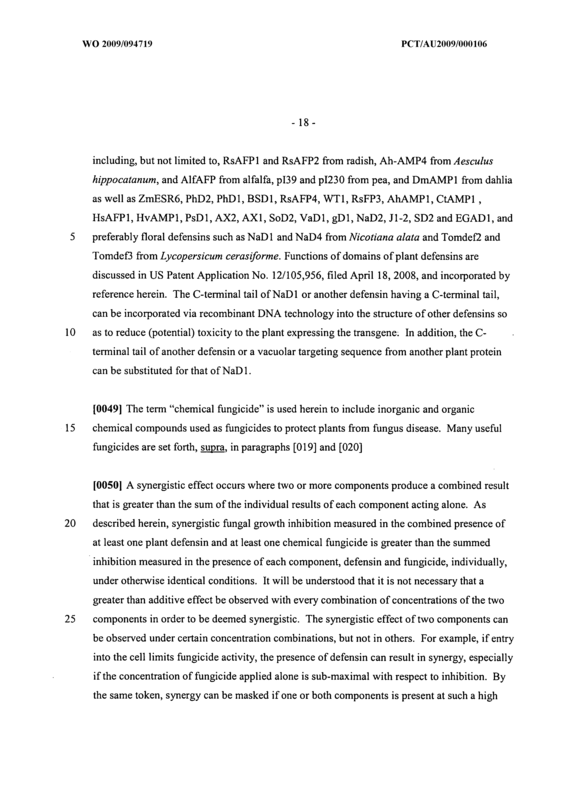 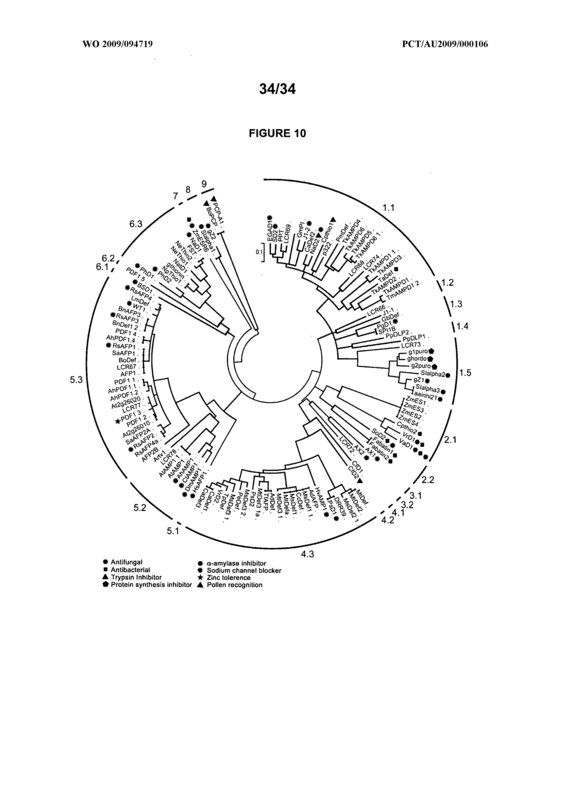 The system of Claim 1, wherein the plant defensin is NaDl or a variant thereof which retains antifungal activity. 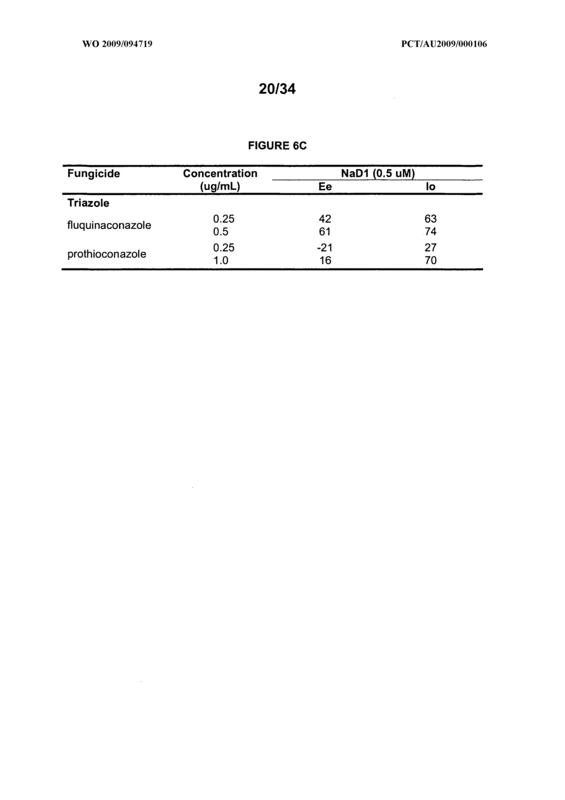 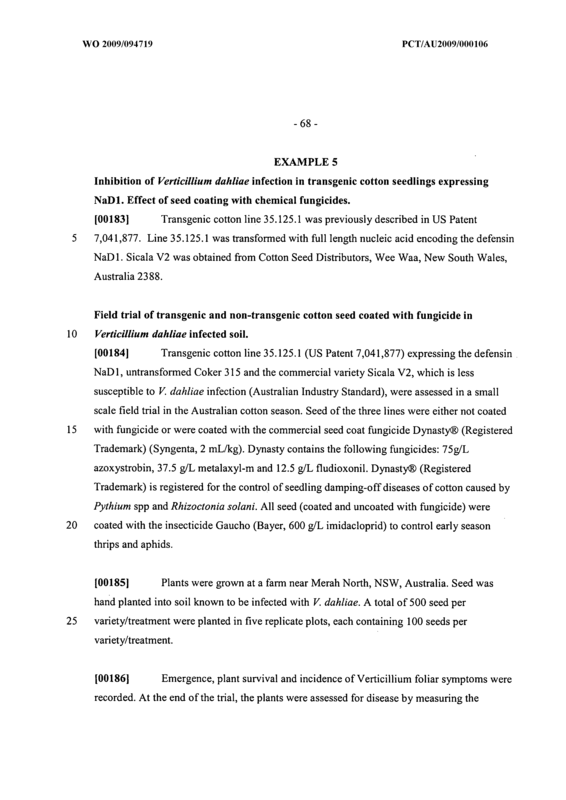 The system of Claim 1, wherein the chemical fungicide is a strobilurin or a triazole or a metalaxyl fungicide. 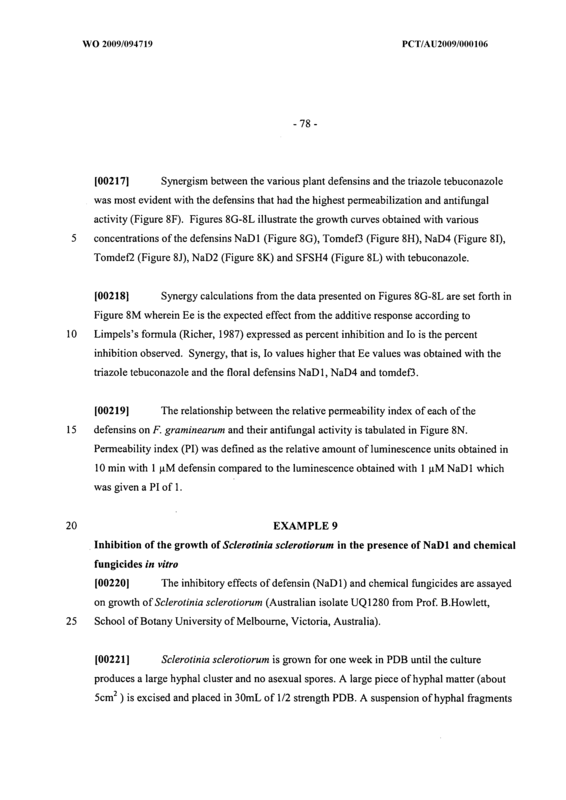 The system of Claim 7, wherein the defensin is a floral defensin. 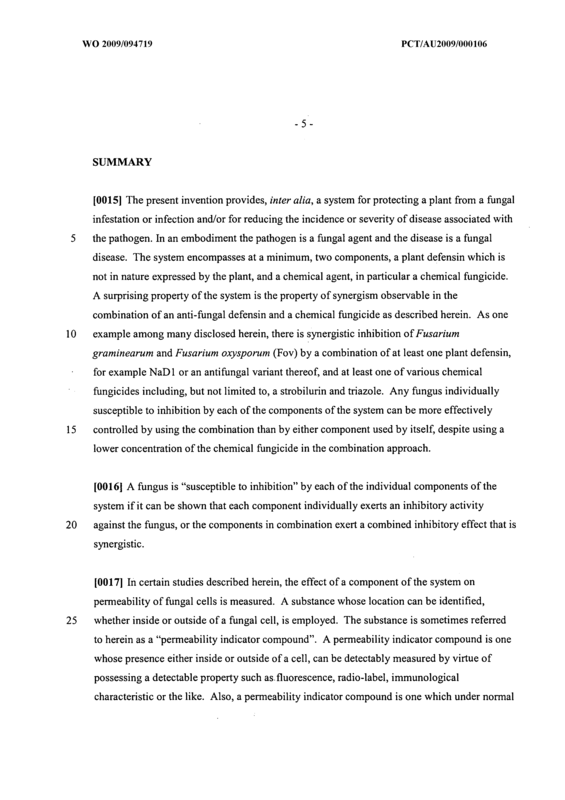 The system of Claim 7, wherein the defensin exhibits a relative permeability index of greater than 0.12 in contact with the susceptible fungus. 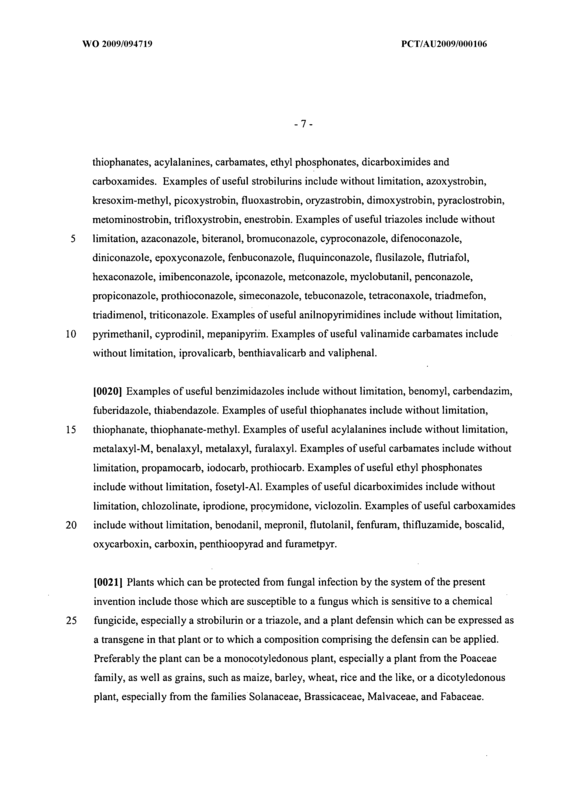 The system of Claim 7, wherein the defensin is a defensin of a solanaceous plant. 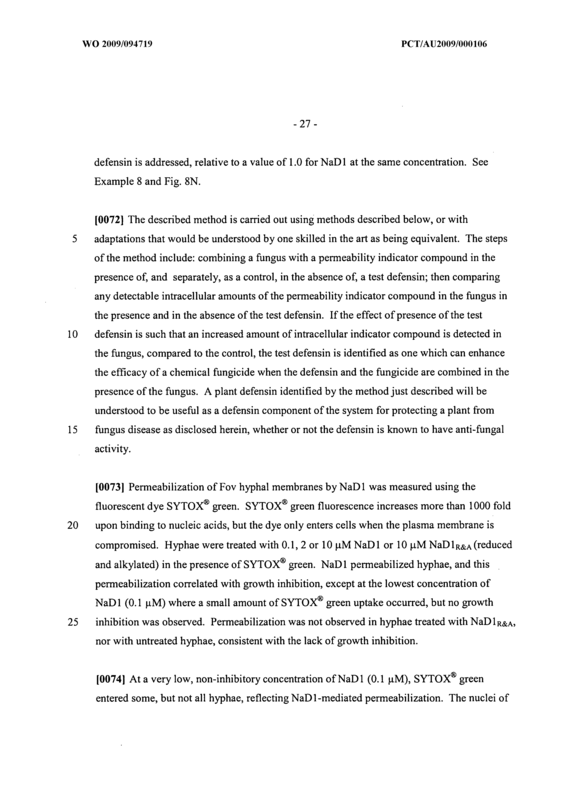 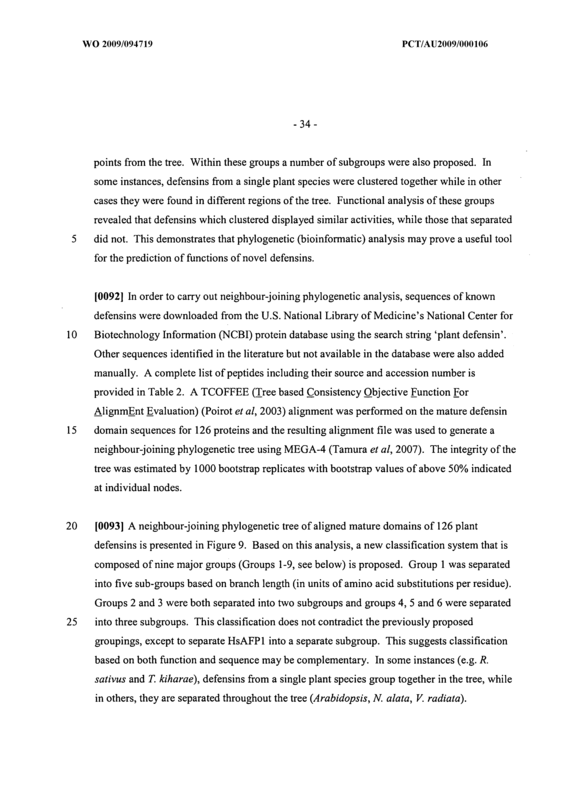 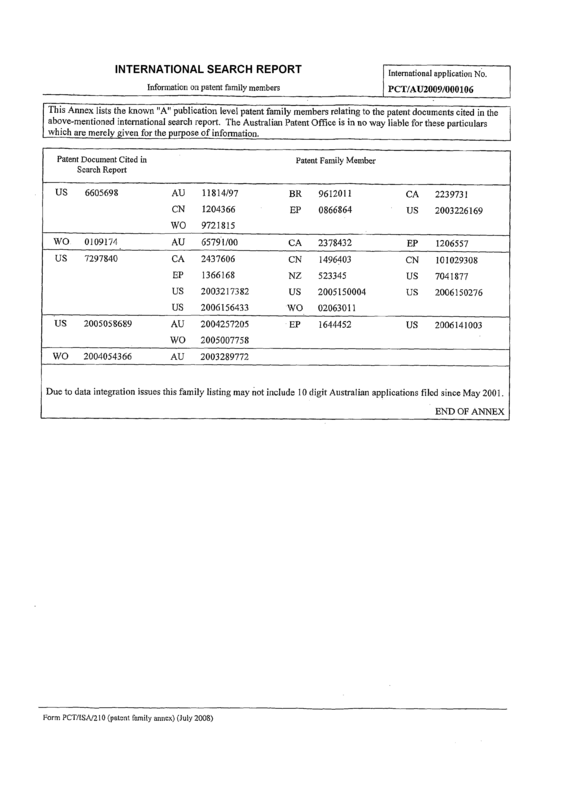 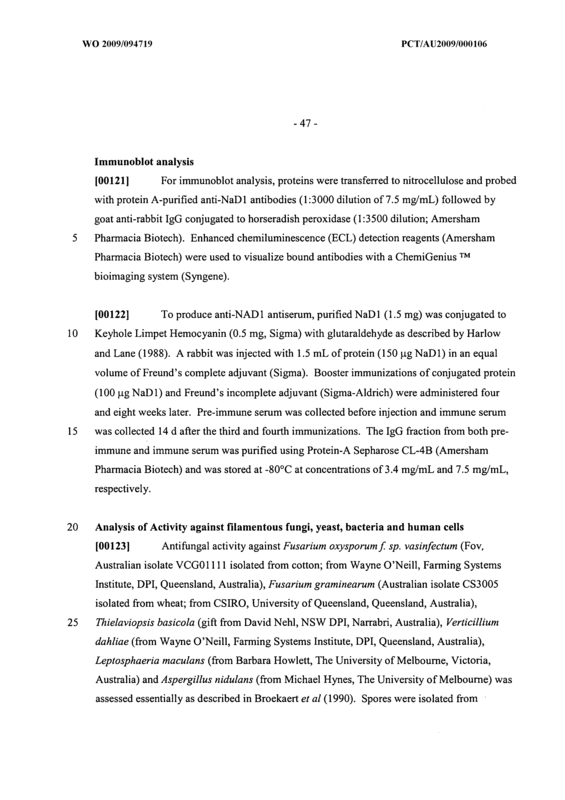 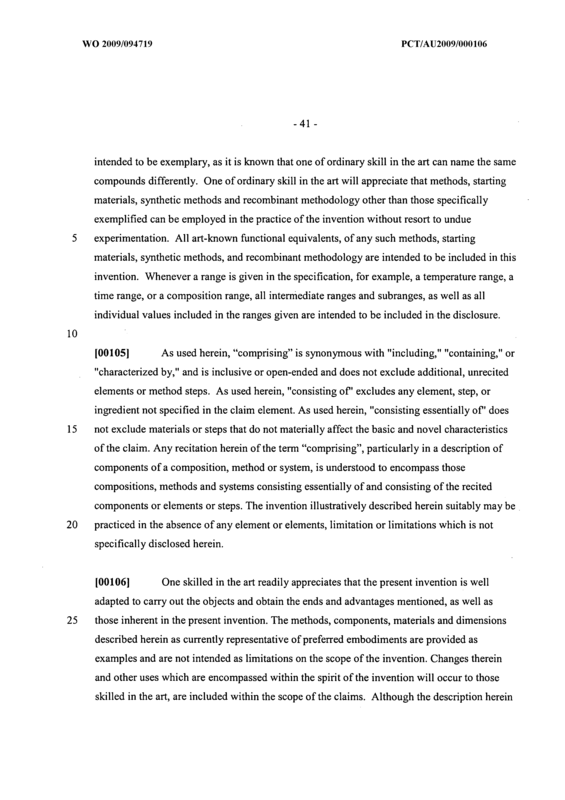 The system of Claim 7, wherein the defensin is selected from the group consisting of NaDl, NaD4, Tomdef2 or TomdeO. 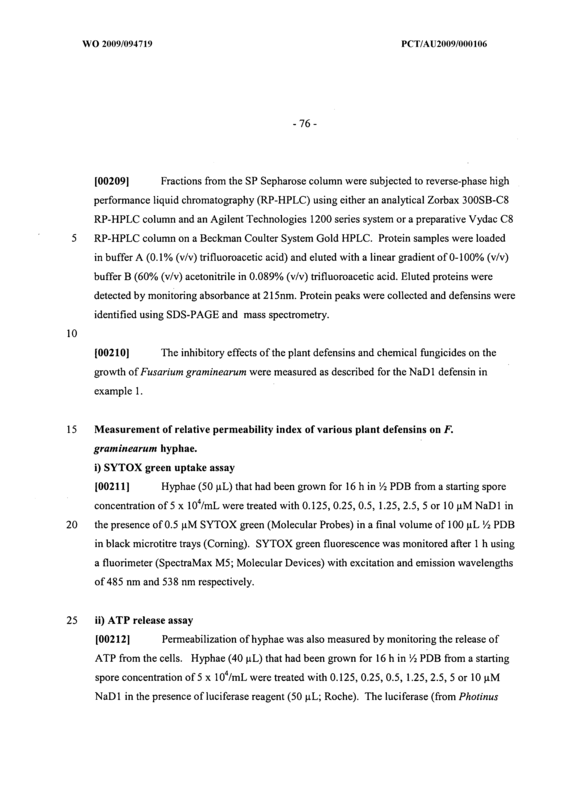 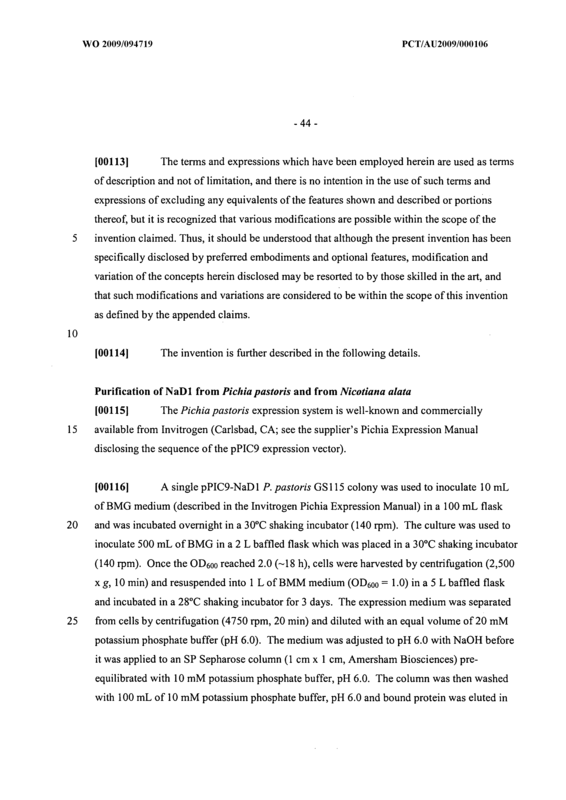 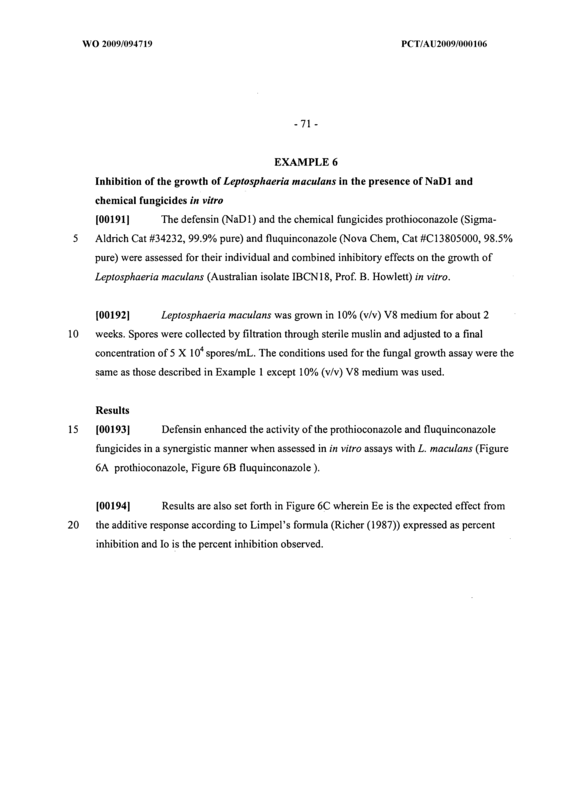 The system of Claim 7, wherein the strobilurin fungicide is azoxystrobin, picoxystrobin or fluoxastrobin. 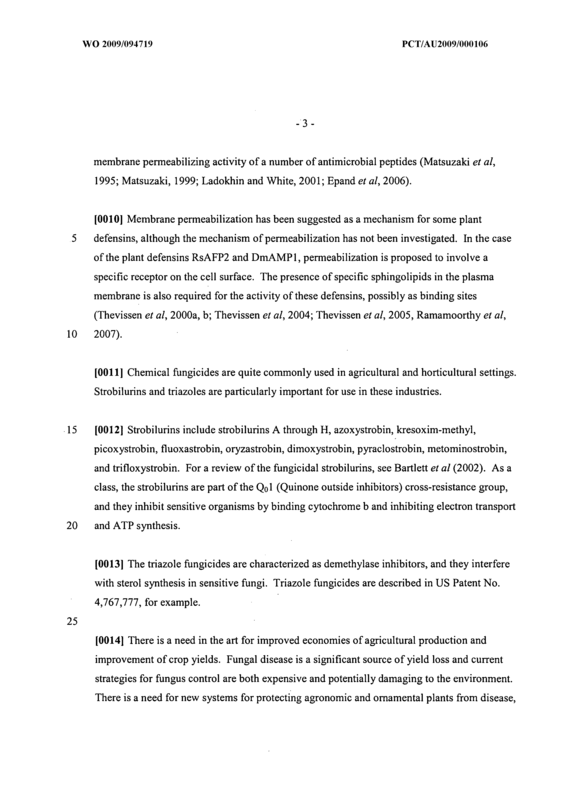 The system of Claim 7, wherein the triazole fungicide is propiconazole, tebuconazole, flusilazole, fluquinconazole or prothioconazole. 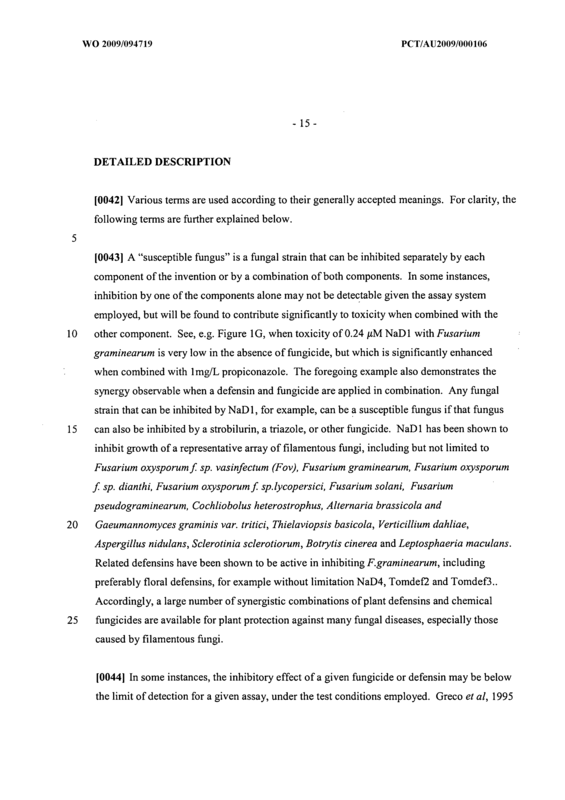 The system of Claim 1, wherein the susceptible fungus is a filamentous fungus. 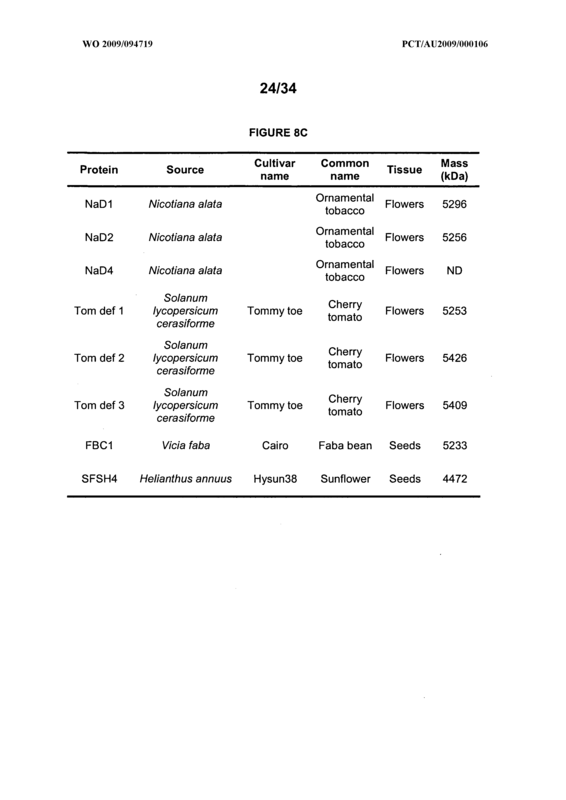 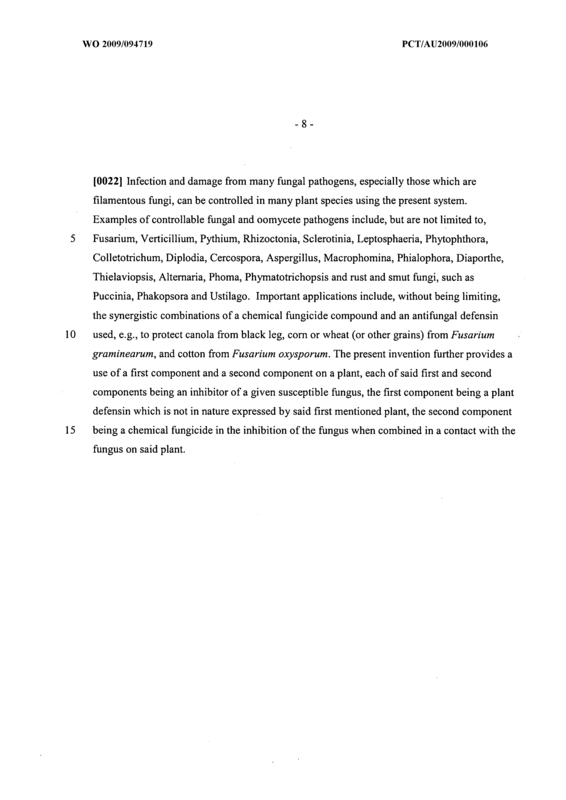 The system of Claim 14, wherein the filamentous fungus is selected from the groups consisting of Fusarium, Sclerotinia, Leptosphaeria or Verticillium. 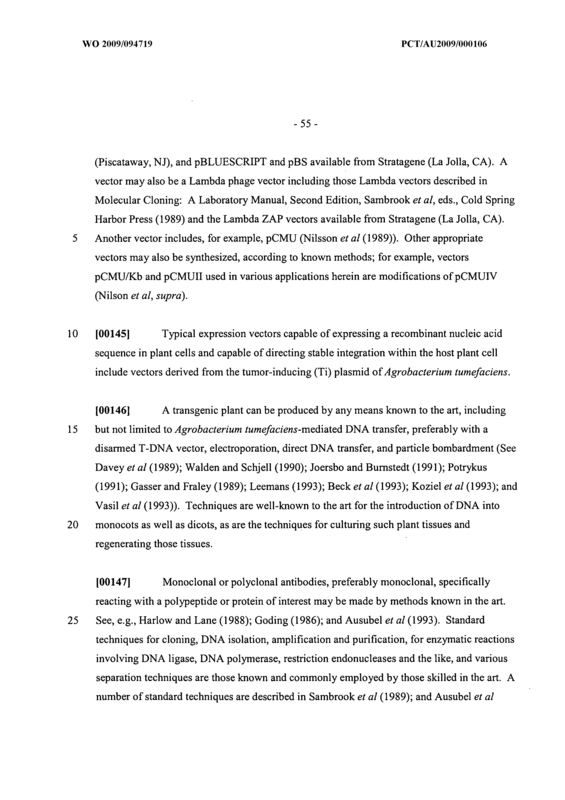 The system of Claim 1, wherein the plant defensin is provided by a transgenic plant expressing the plant defensin. 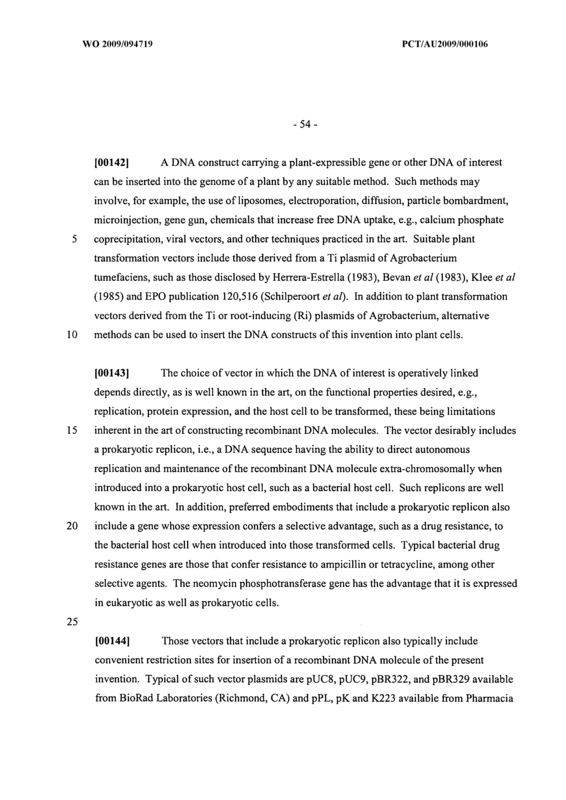 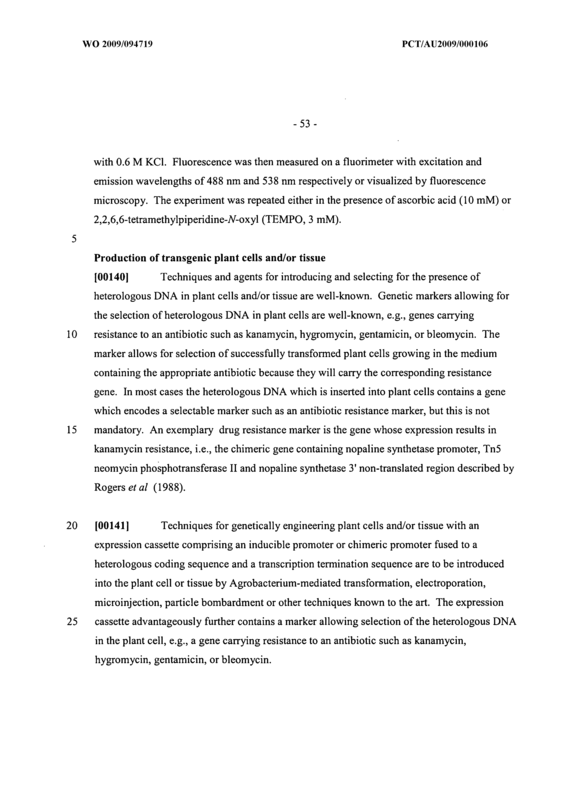 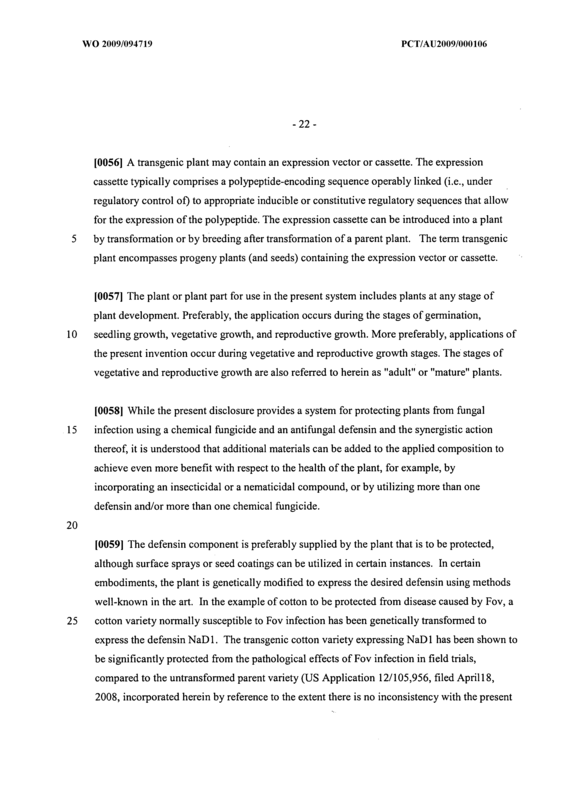 The system of Claim 1, wherein the plant to be protected is a transgenic plant expressing the plant defensin. 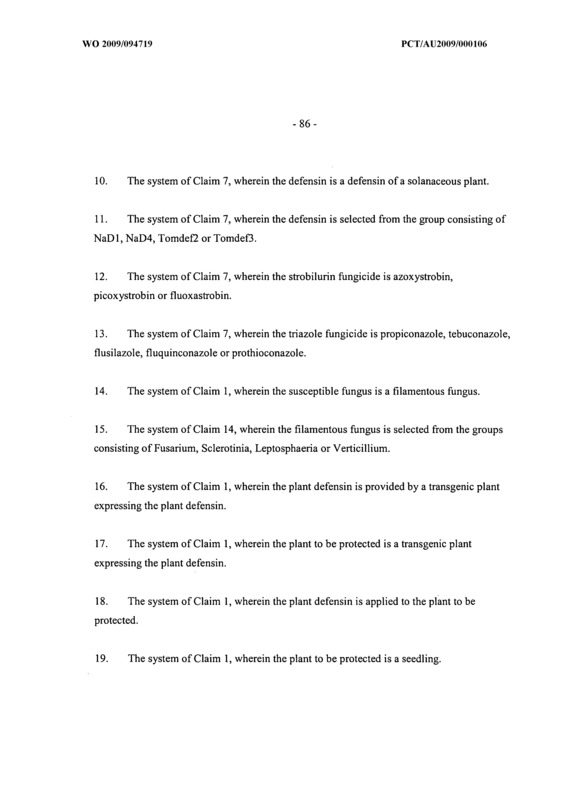 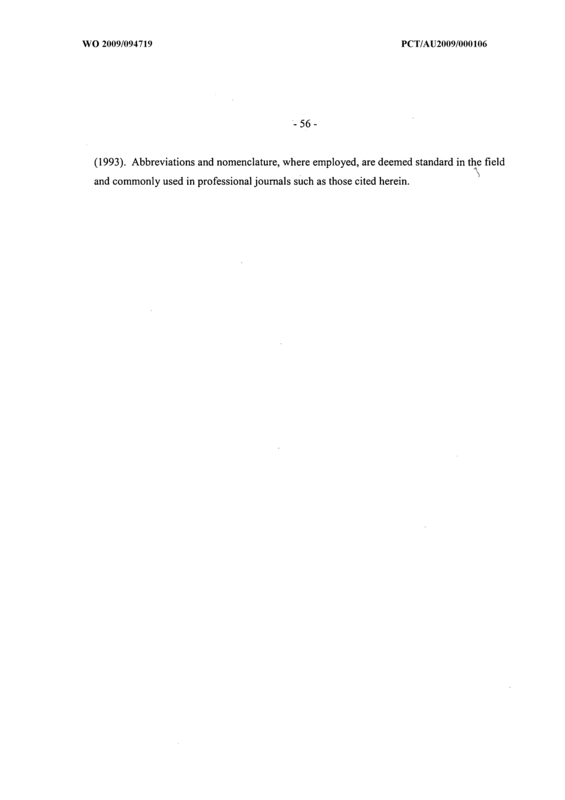 The system of Claim 1, wherein the plant defensin is applied to the plant to be protected. 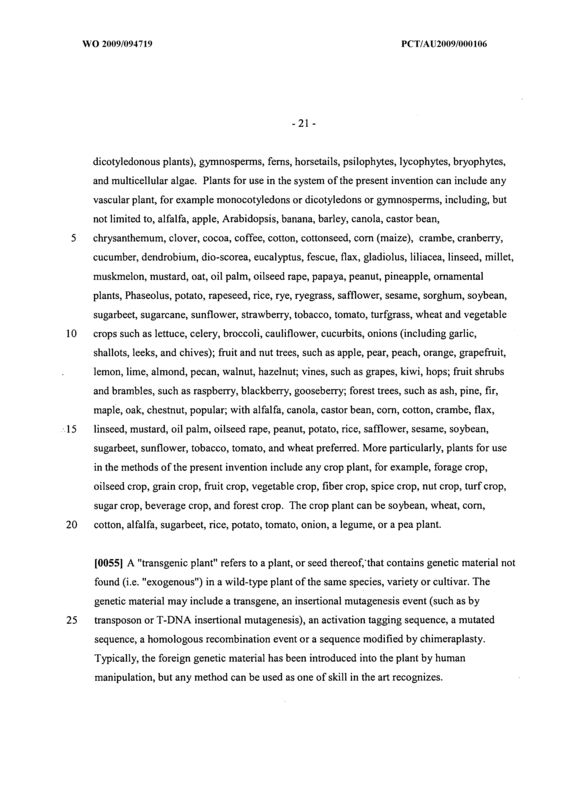 The system of Claim 1, wherein the plant to be protected is a seedling. 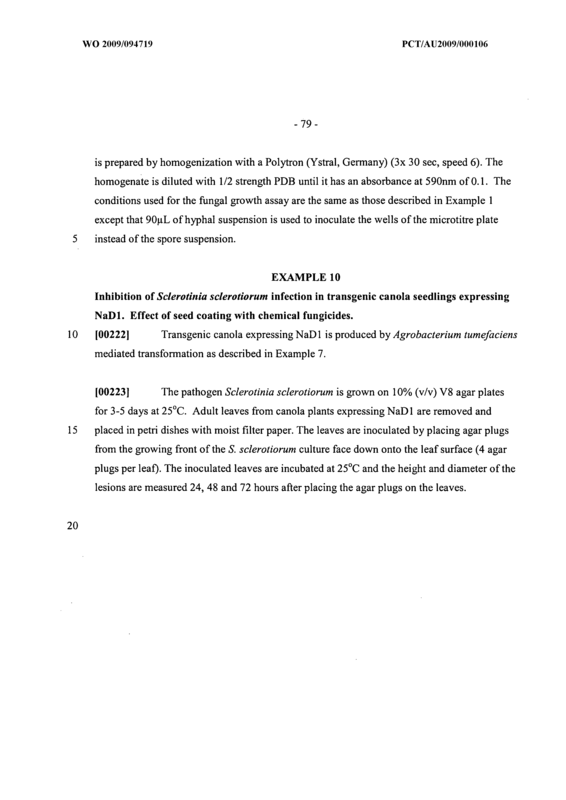 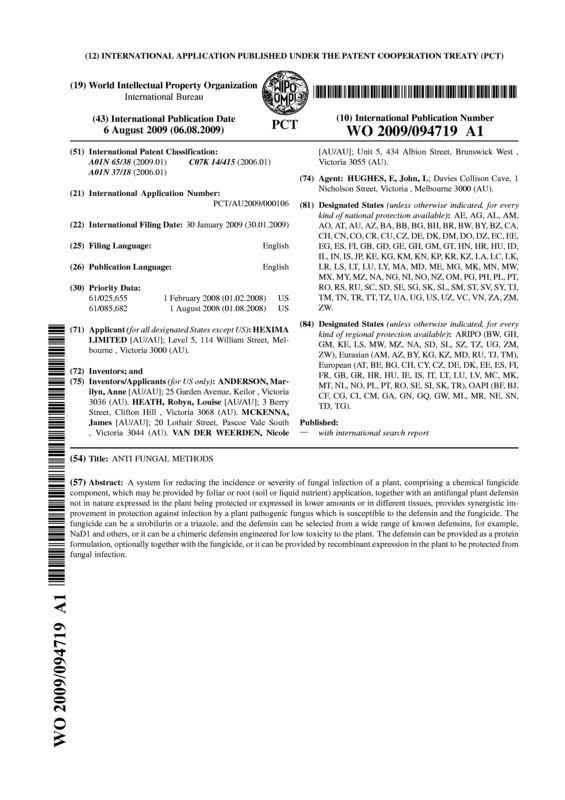 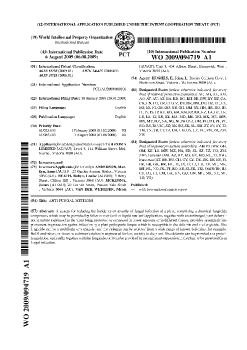 The system of Claim 19, wherein the fungicide is applied to a seed and wherein the plant defensin is expressed by the seedling. 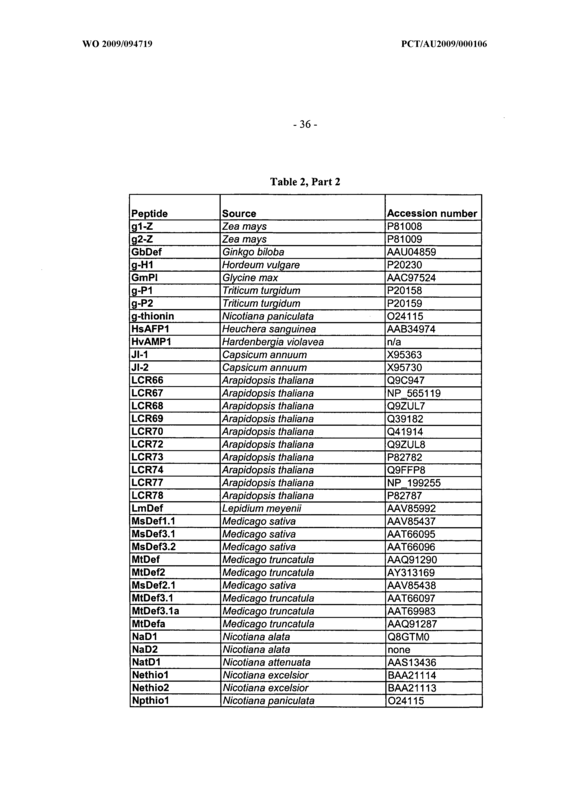 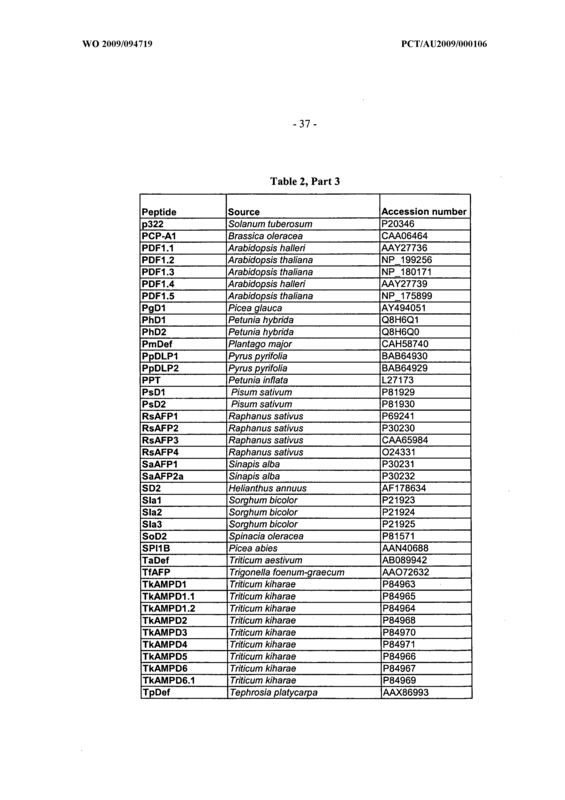 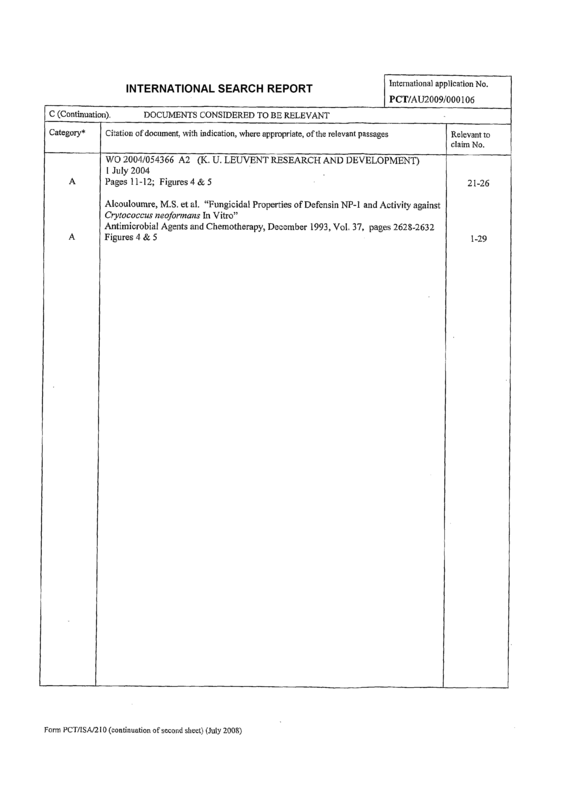 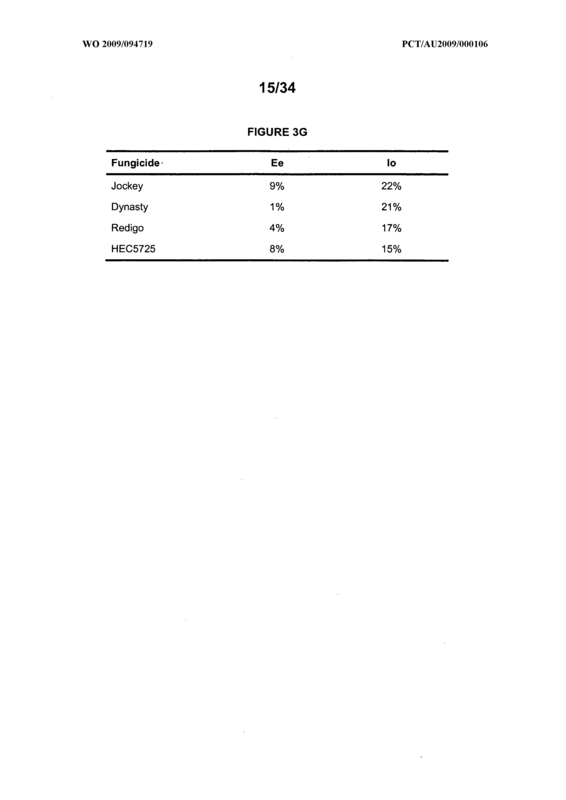 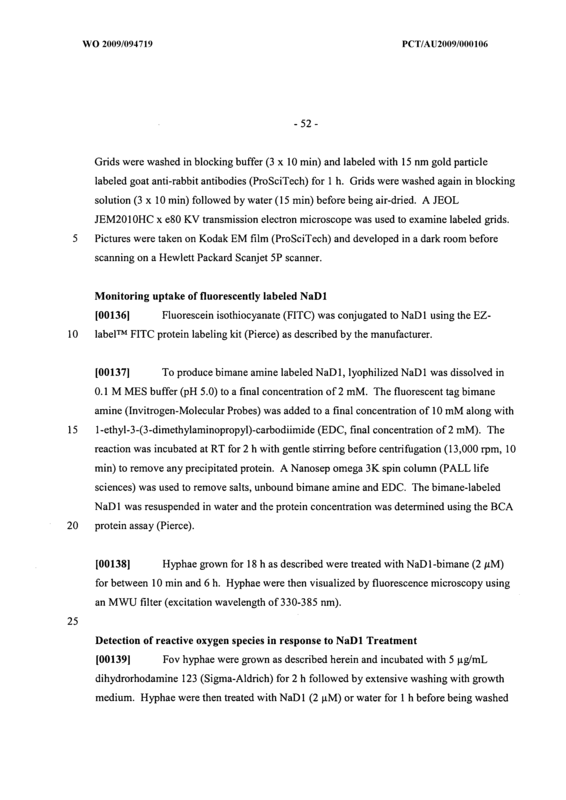 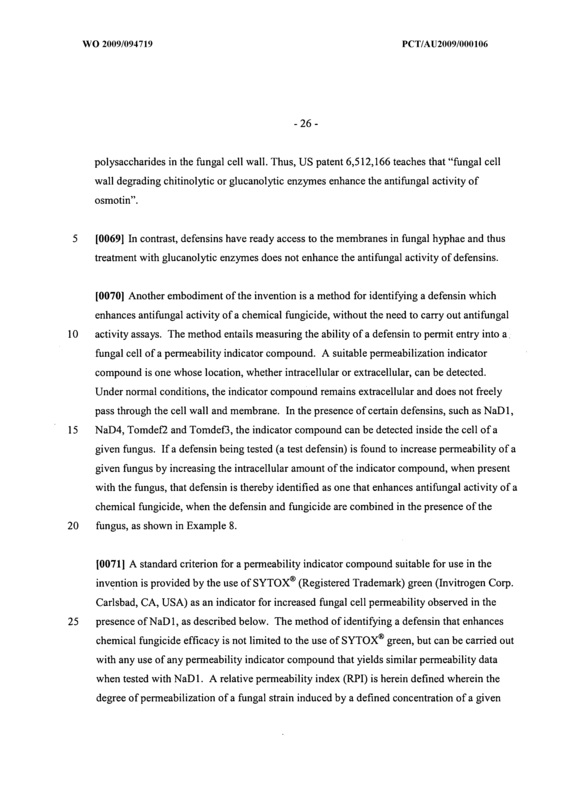 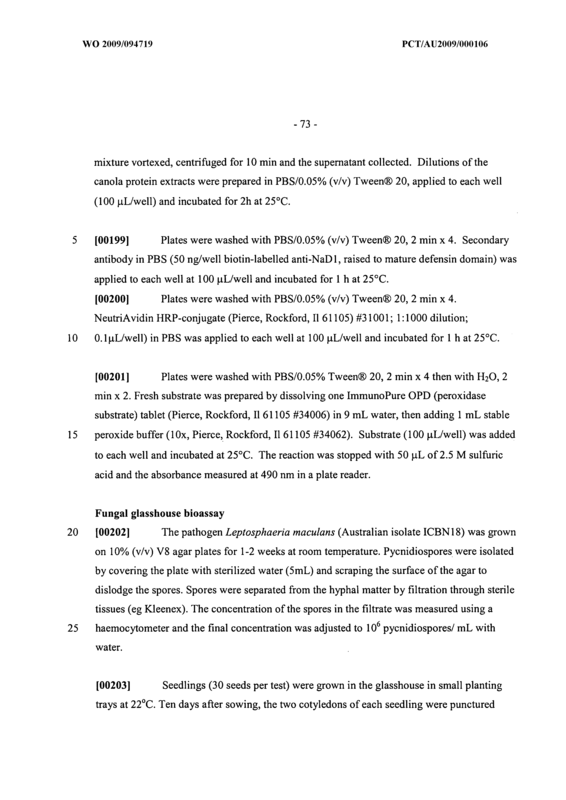 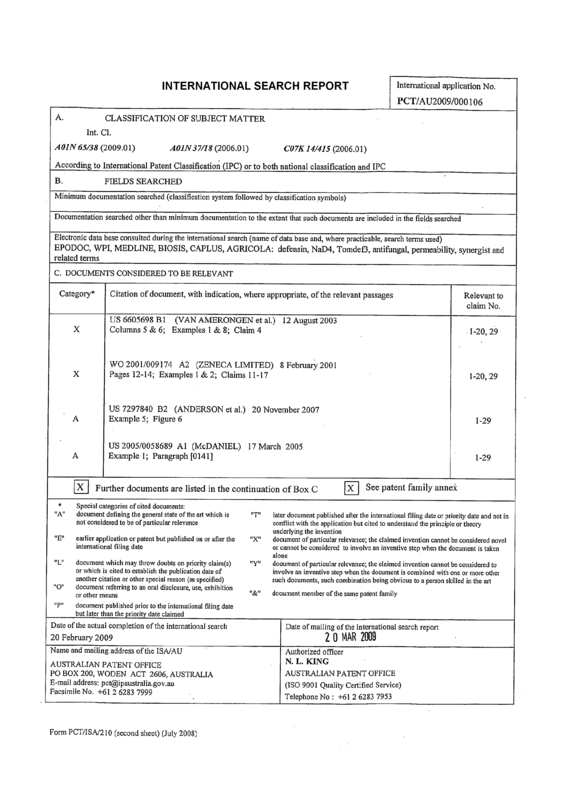 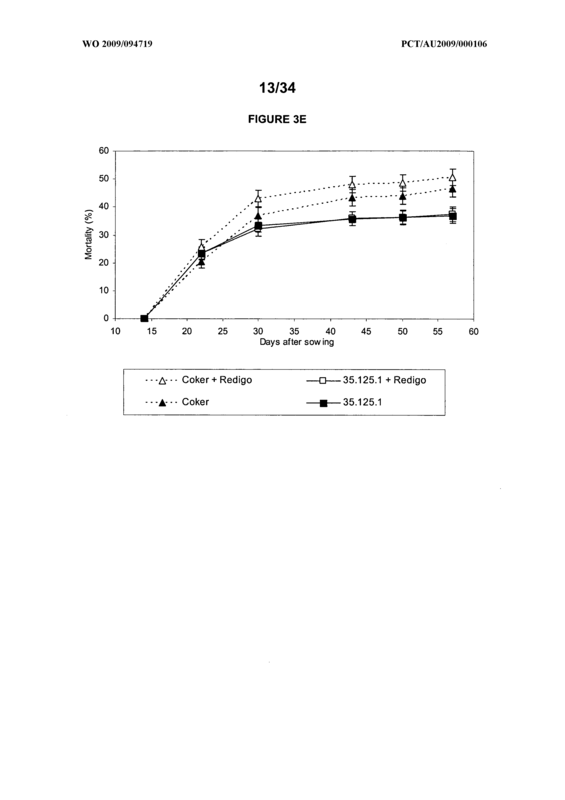 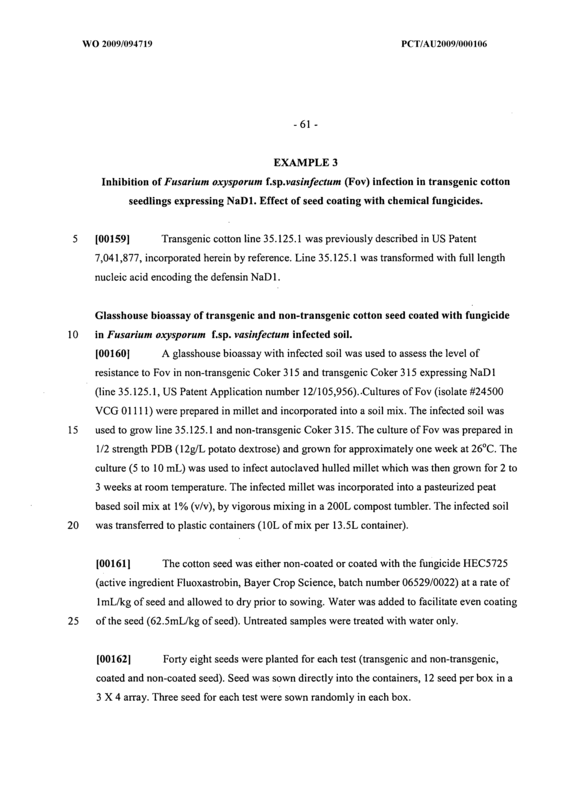 A method for identifying a defensin which enhances antifungal activity of a chemical fungicide, comprising the steps of combining a fungus with a permeability indicator compound in the presence of, and separately, in the absence of, a test defensin; comparing any detectable intracellular amounts of permeability indicator compound in the fungus in the presence and in the absence of the test defensin, whereby a test defensin, the presence of which increases the amount of intracellular permeability indicator compound compared to the intracellular amount of indicator compound detected in the absence of the test defensin, is identified as a defensin which enhances antifungal activity of a chemical fungicide. 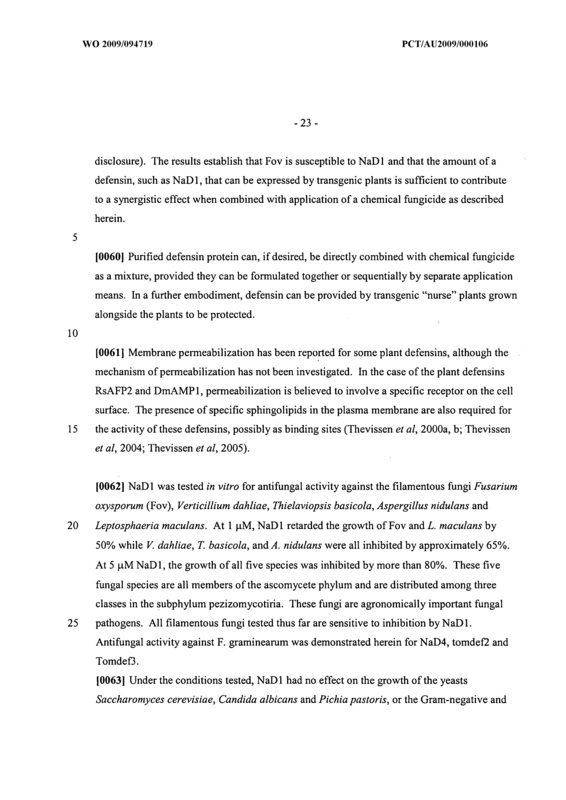 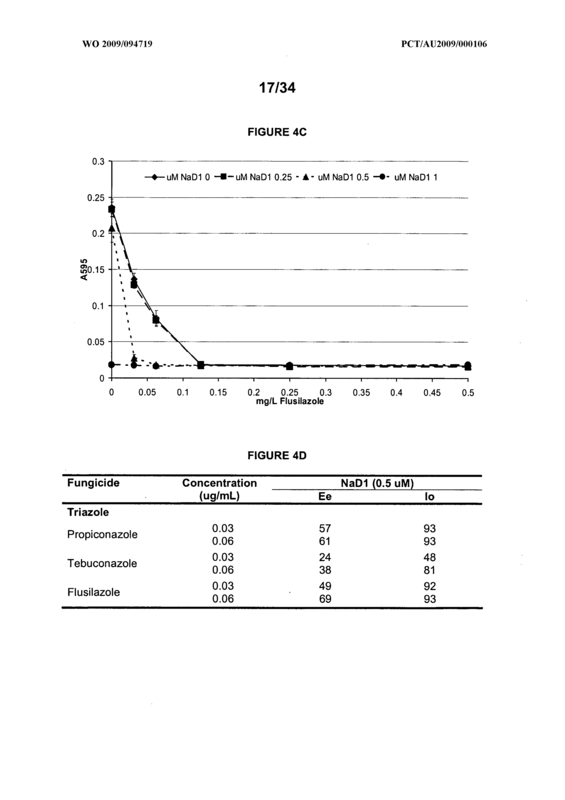 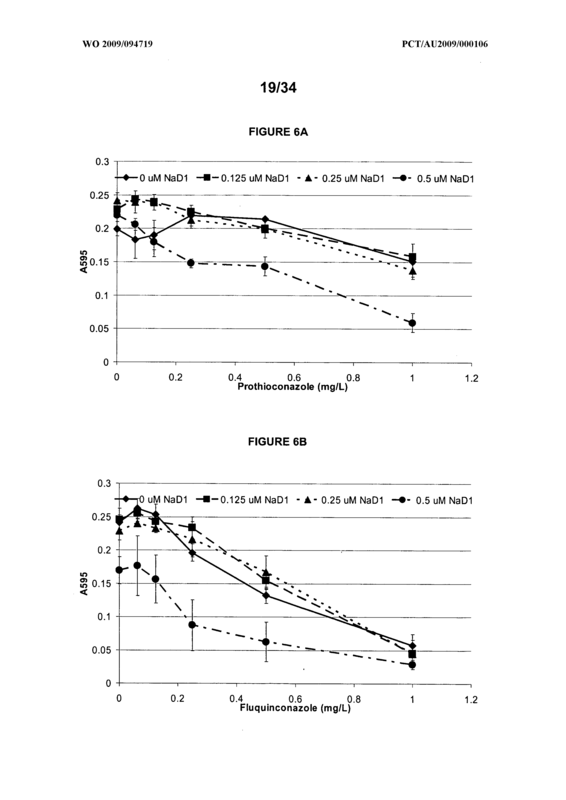 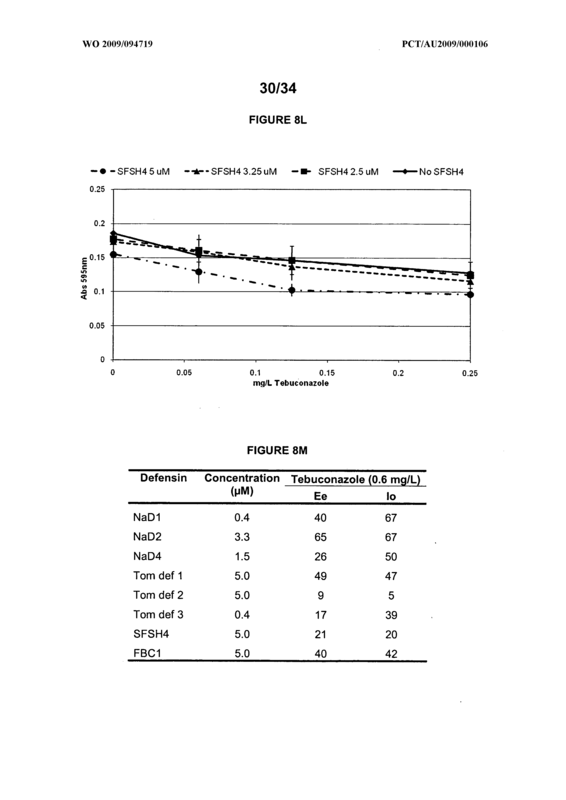 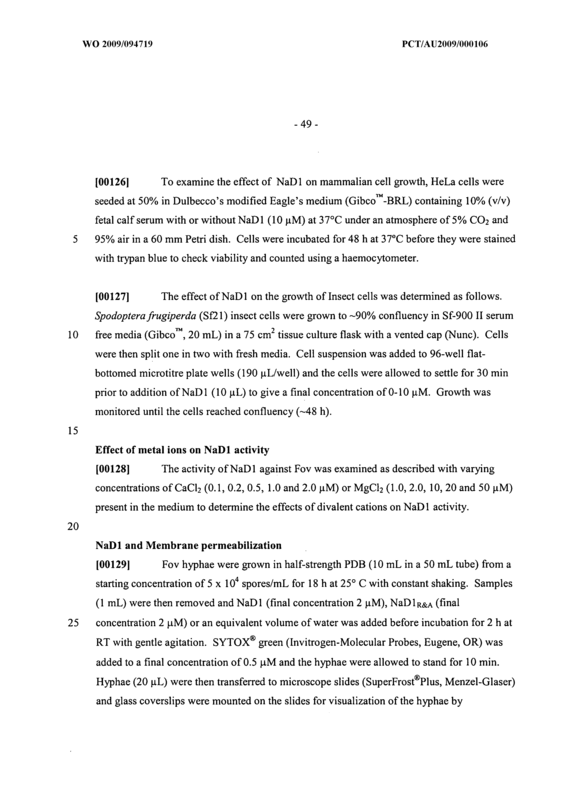 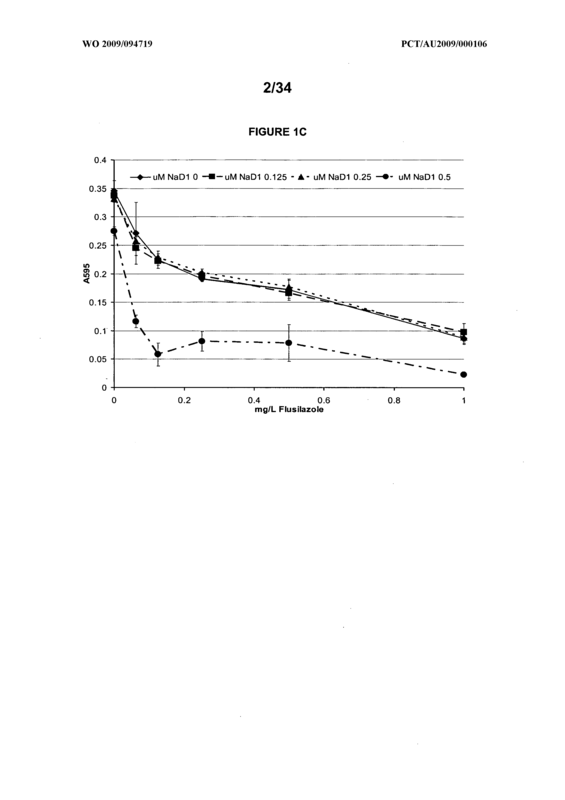 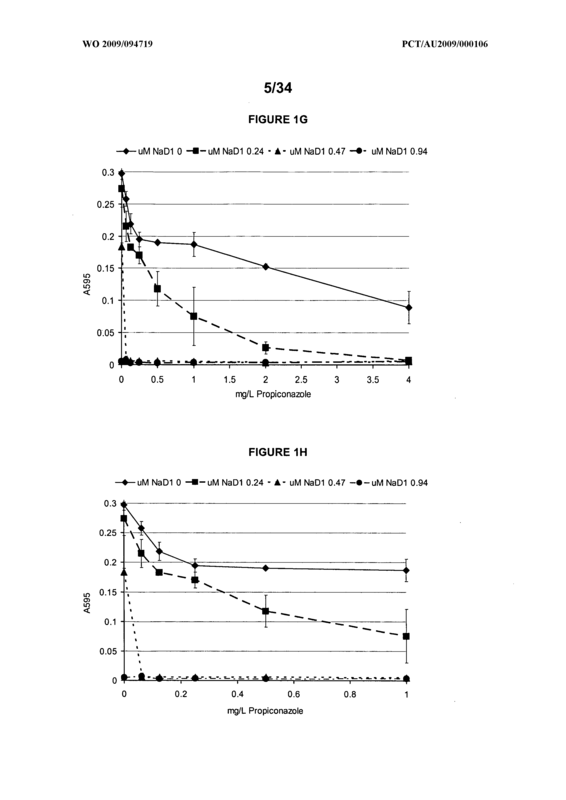 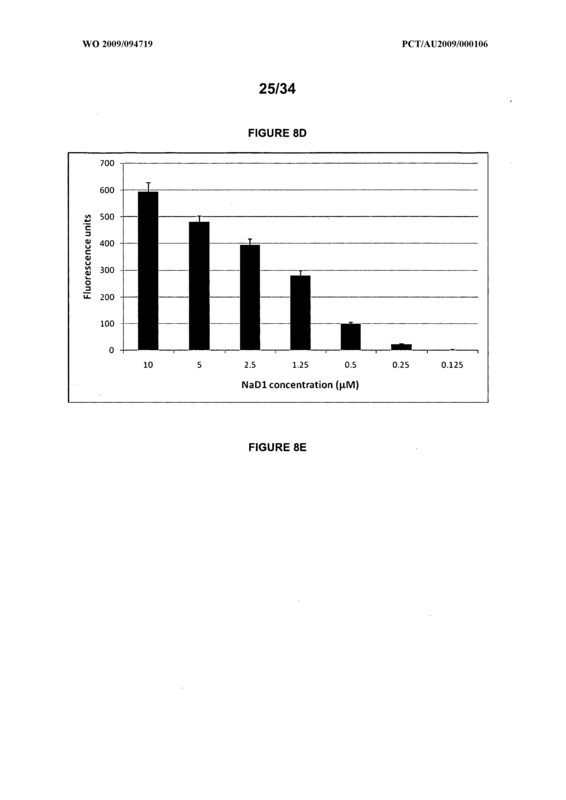 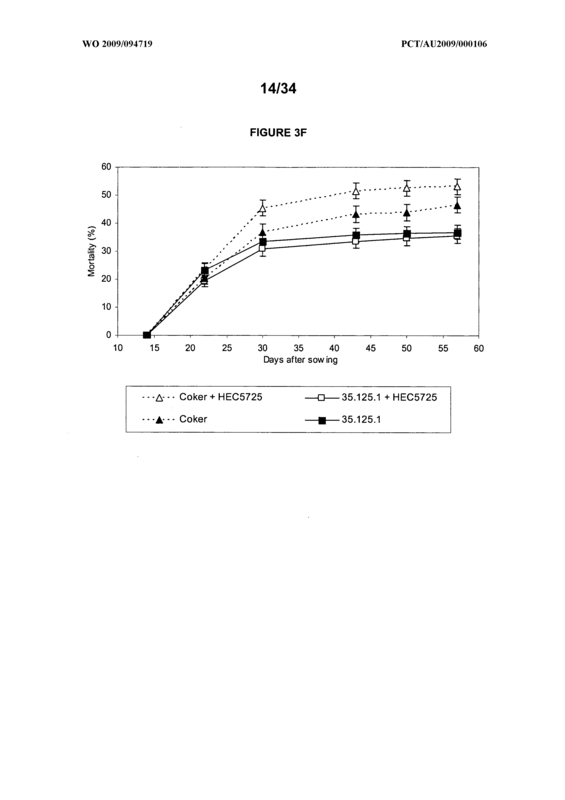 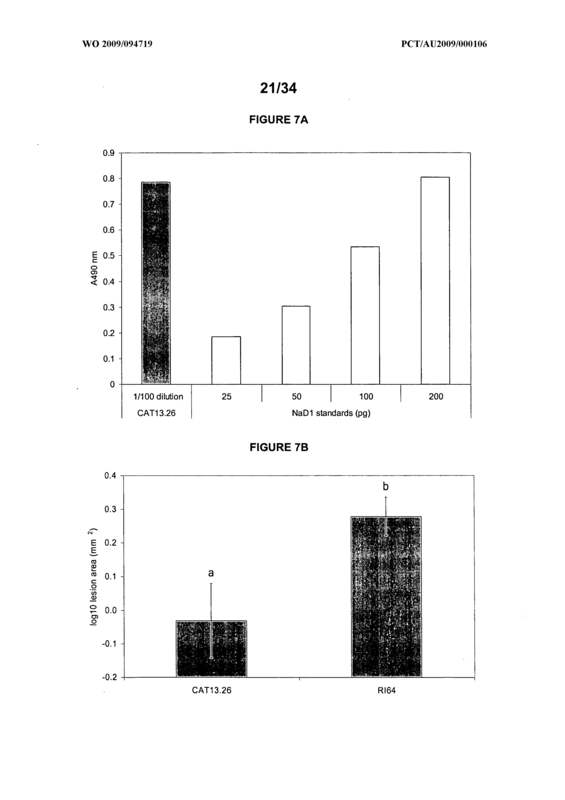 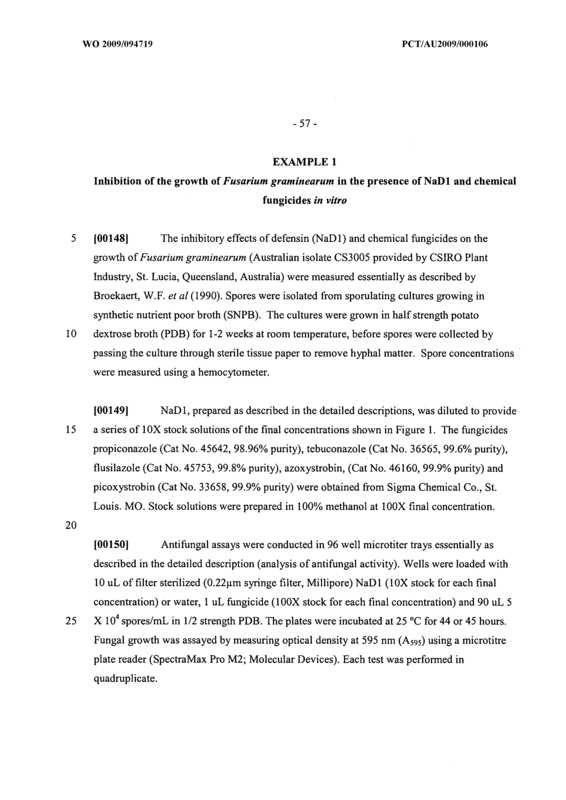 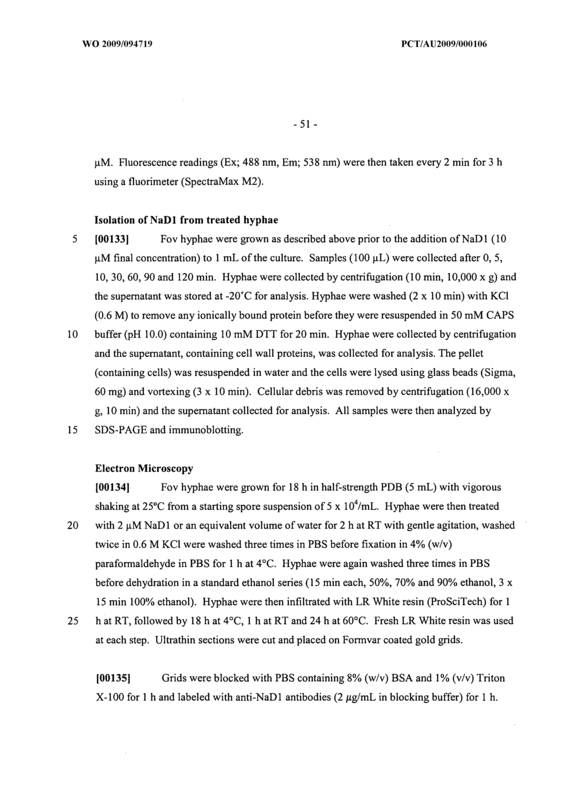 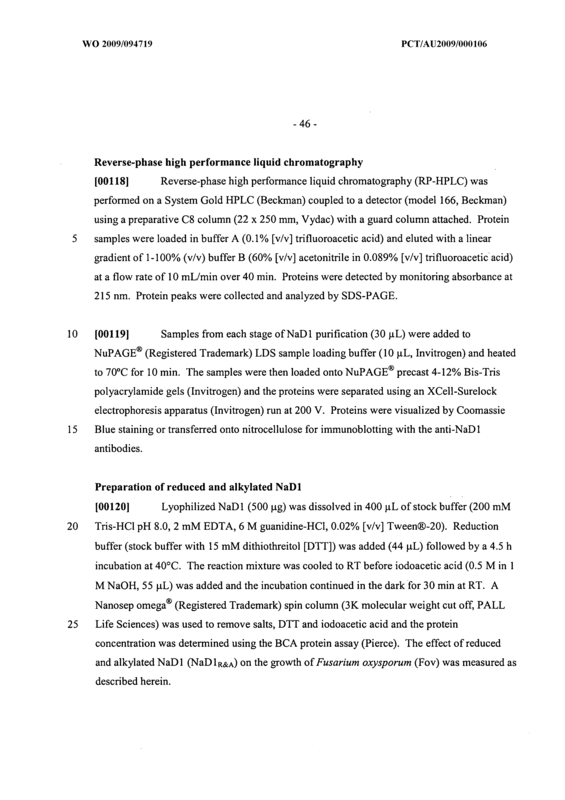 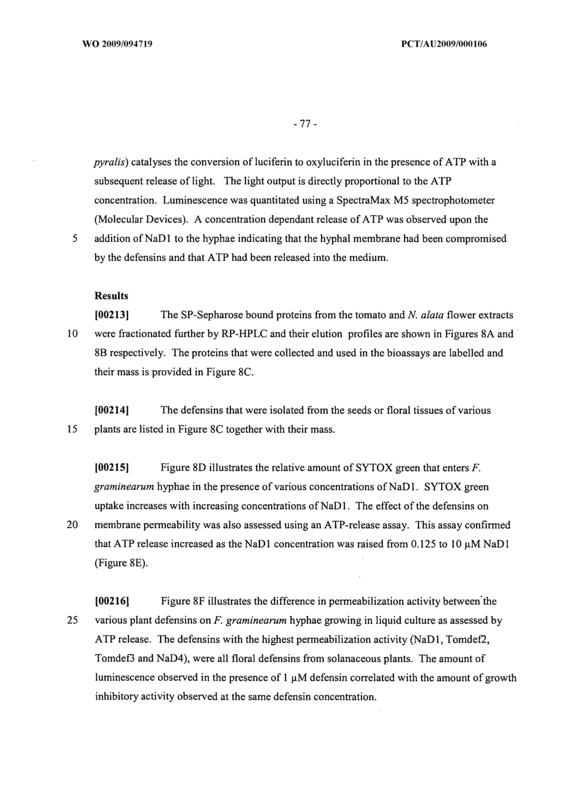 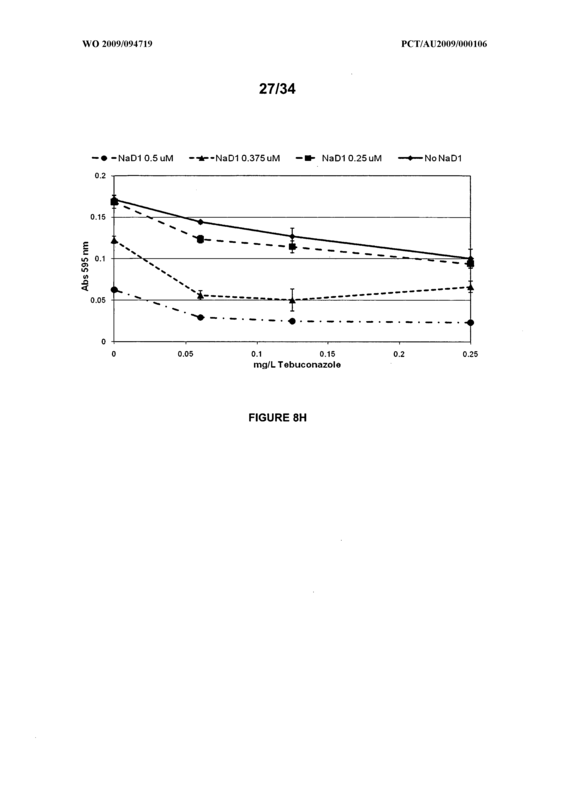 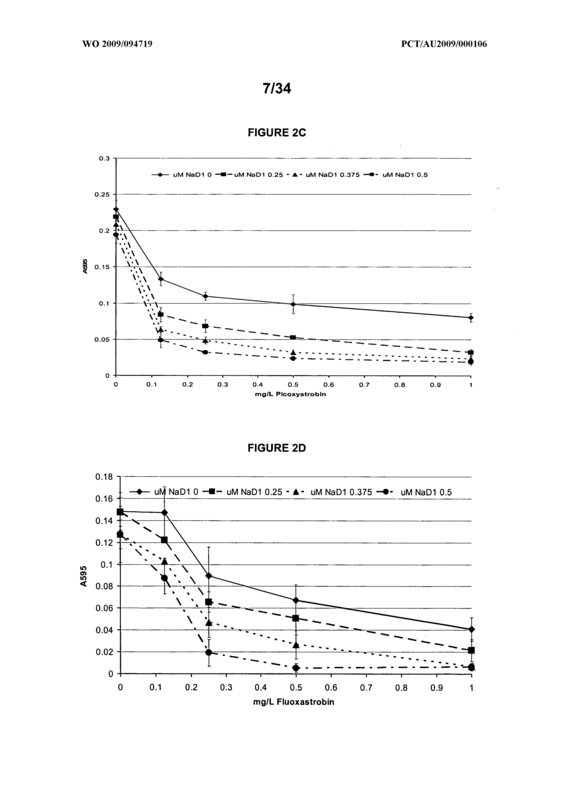 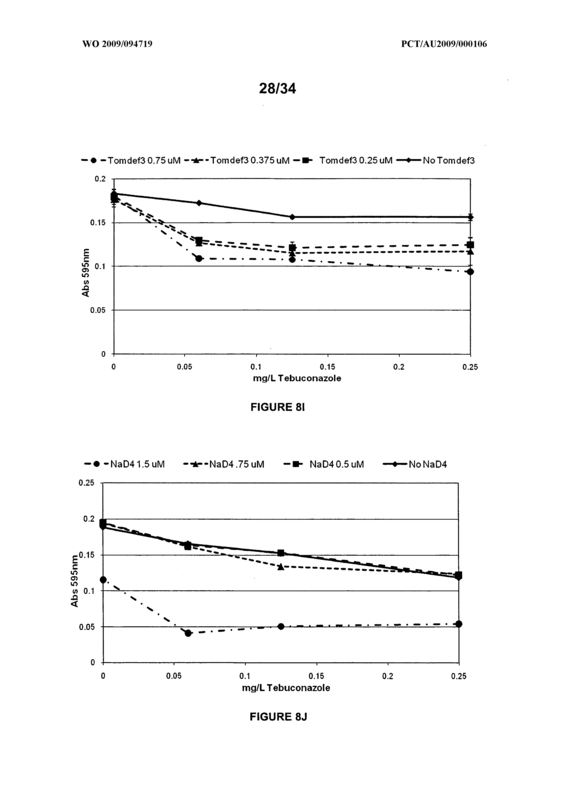 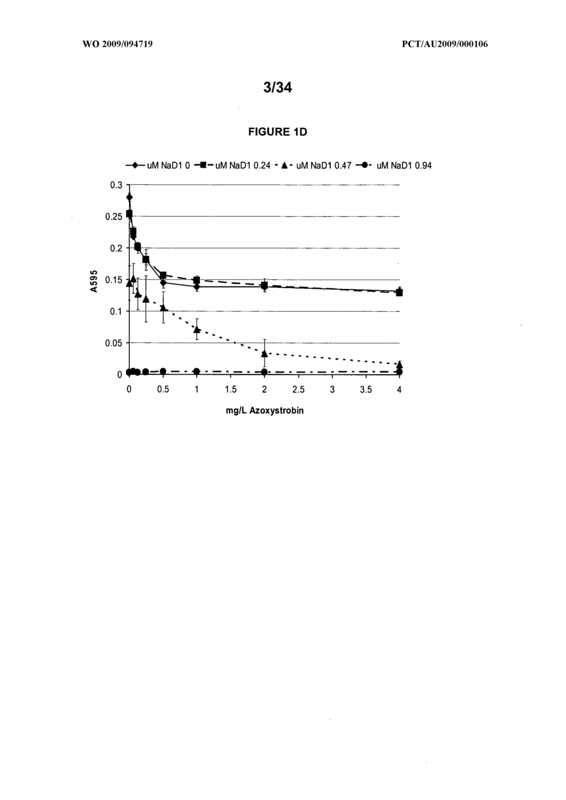 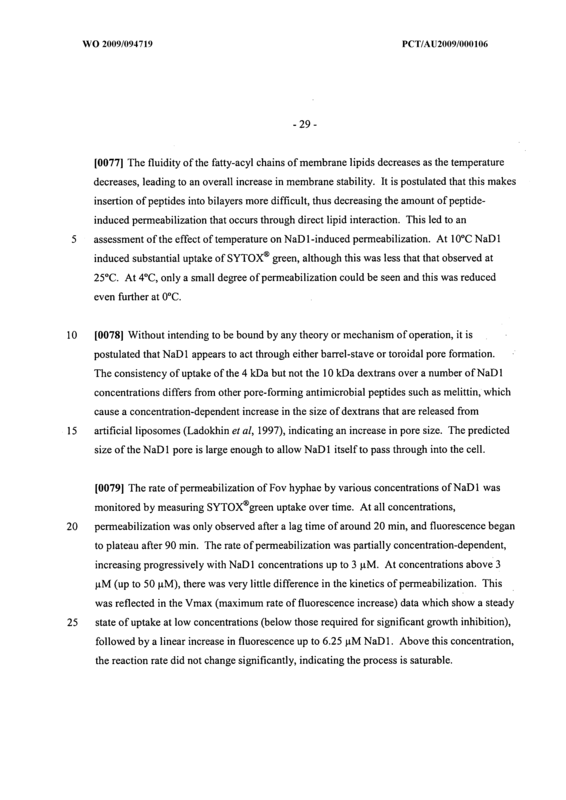 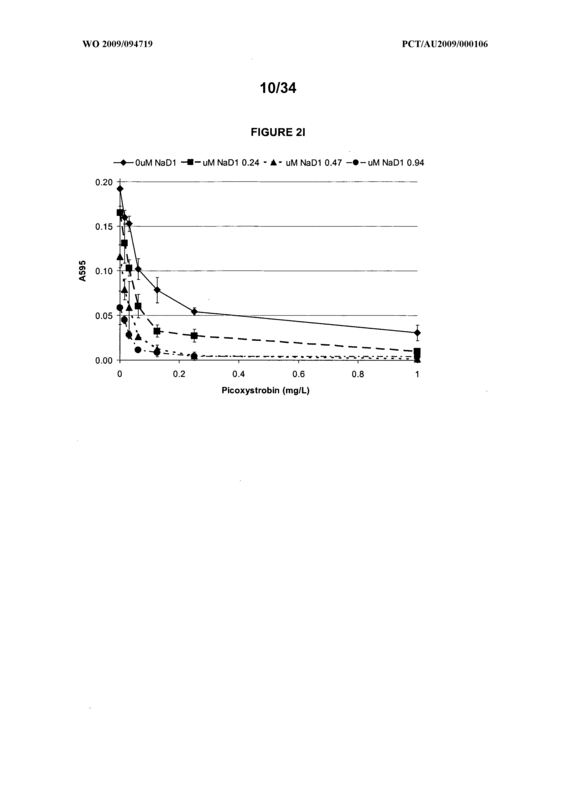 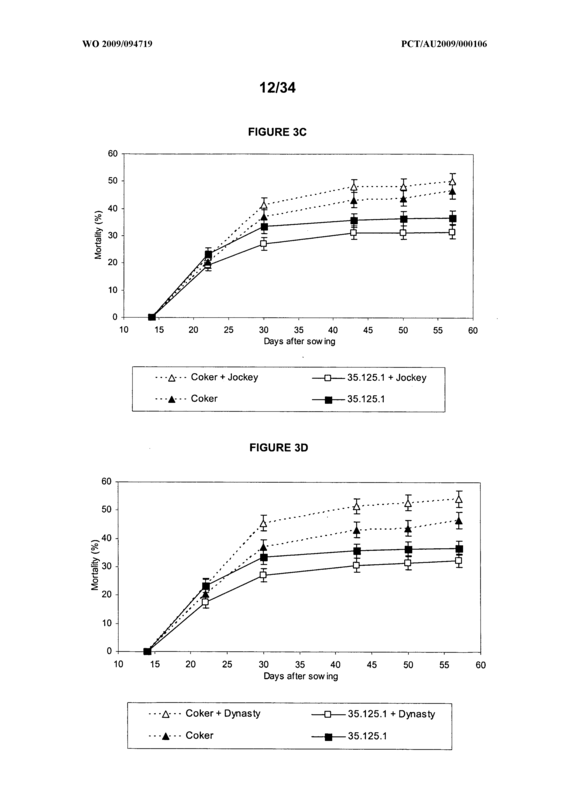 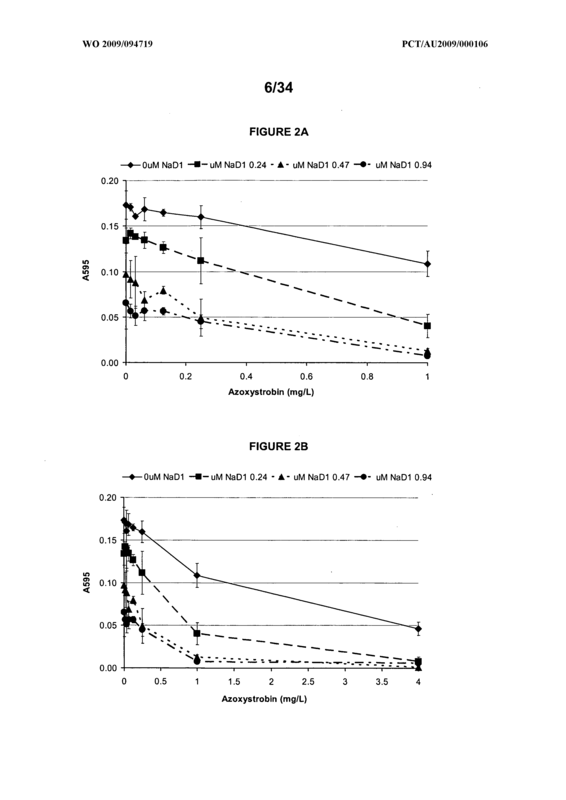 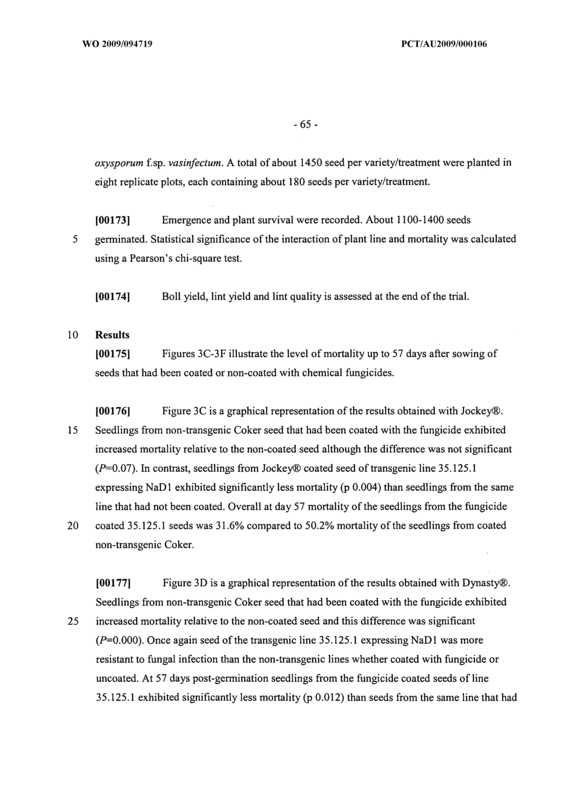 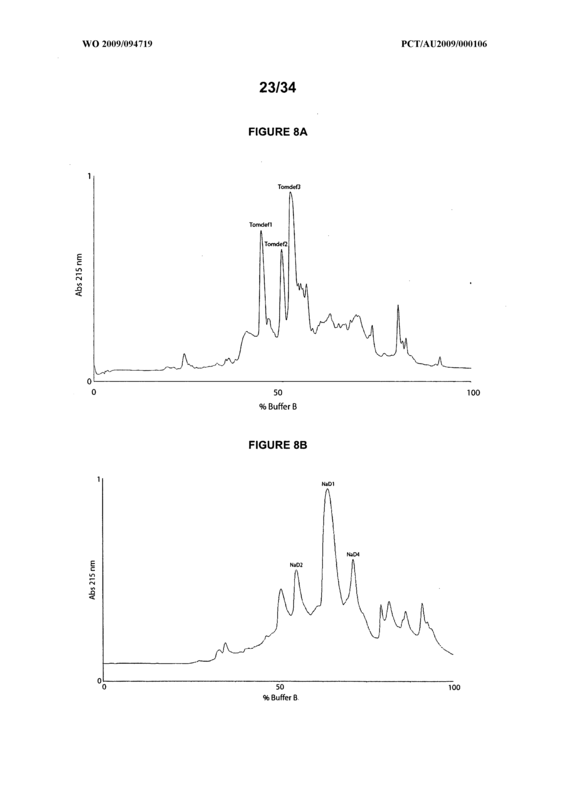 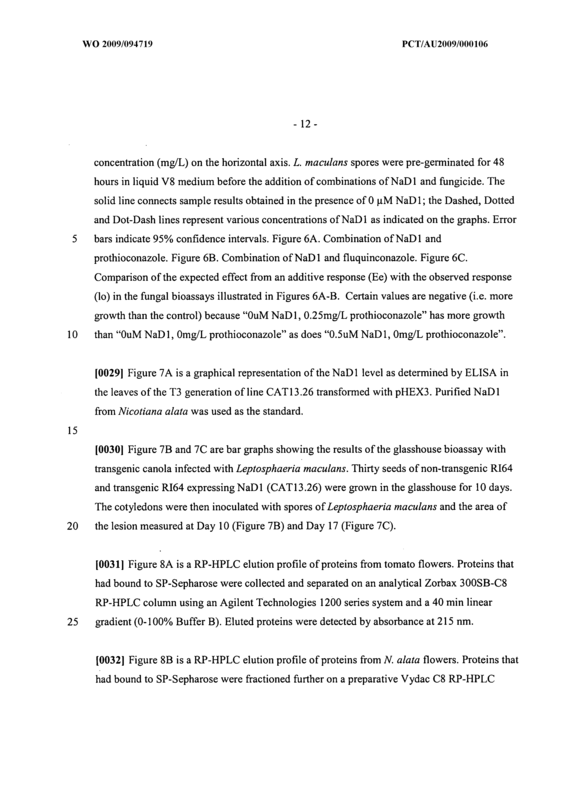 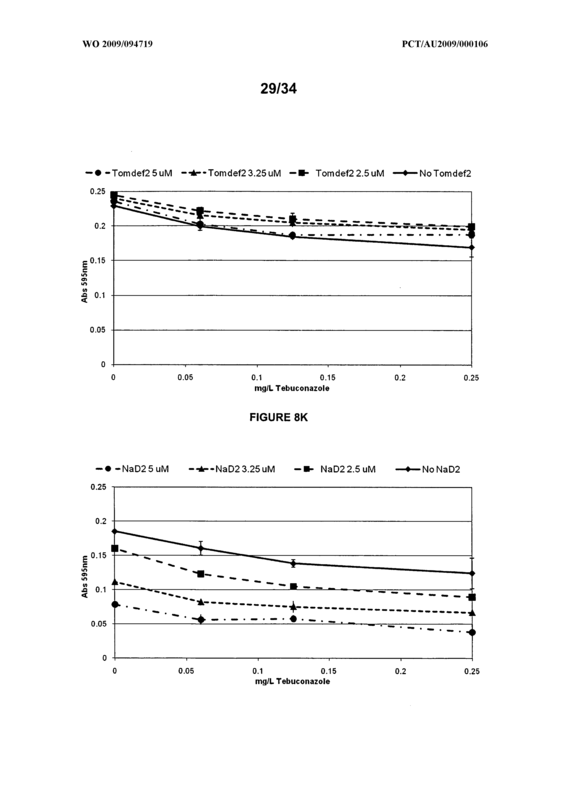 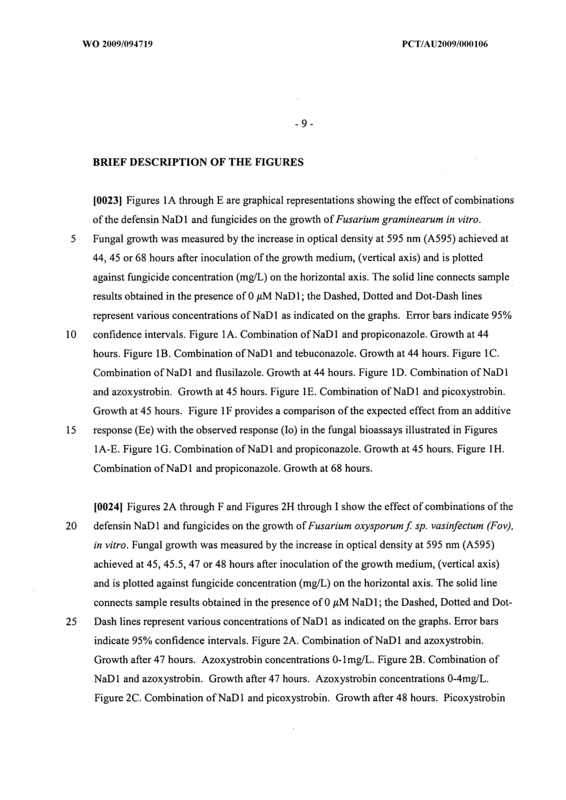 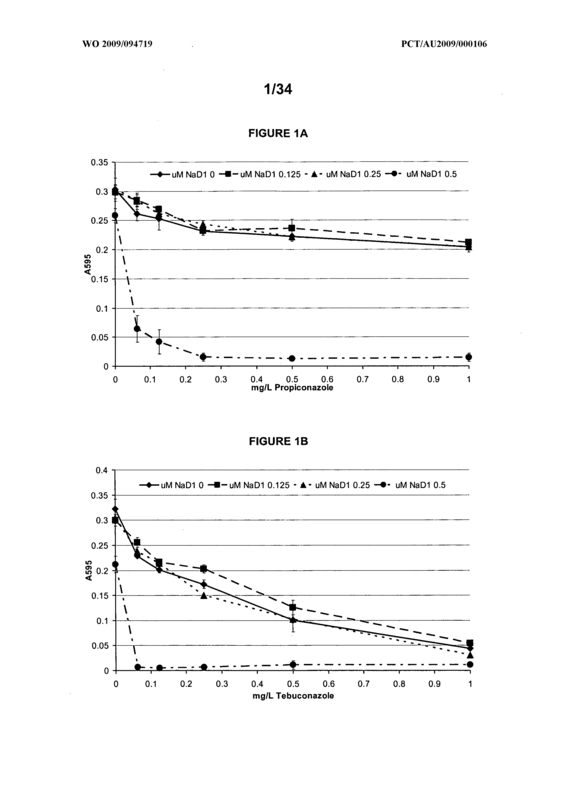 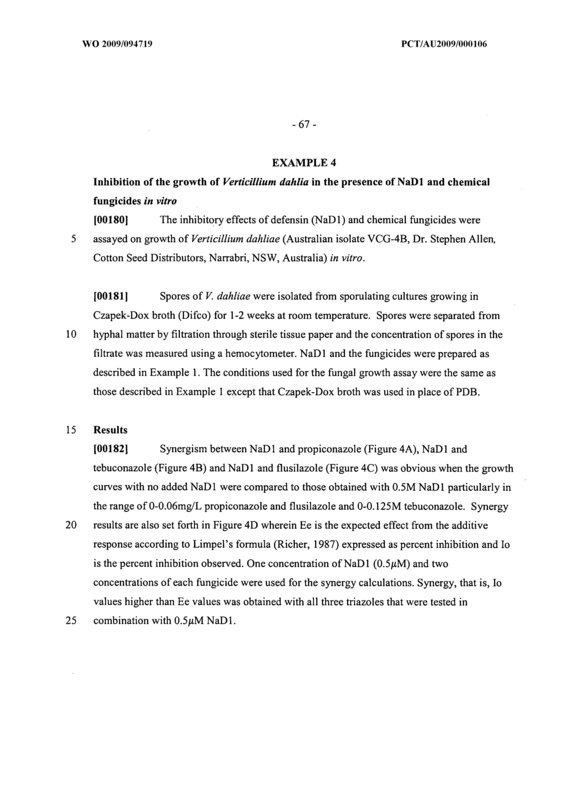 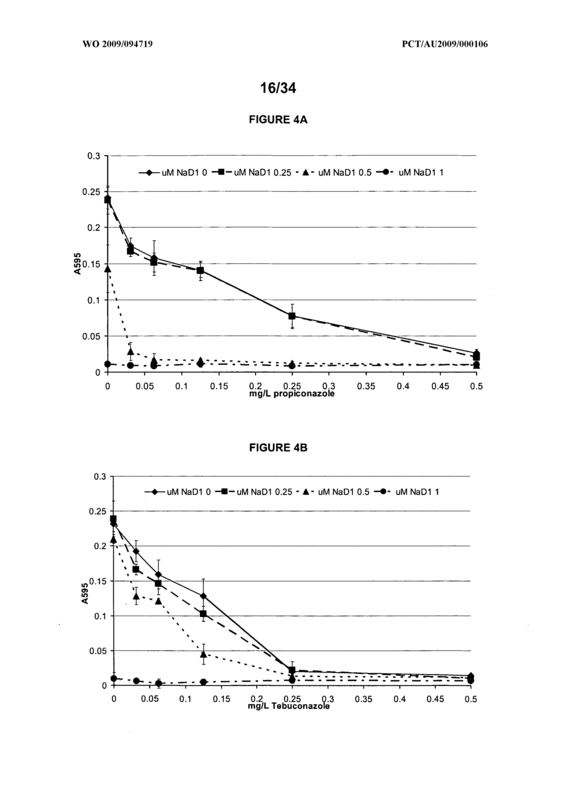 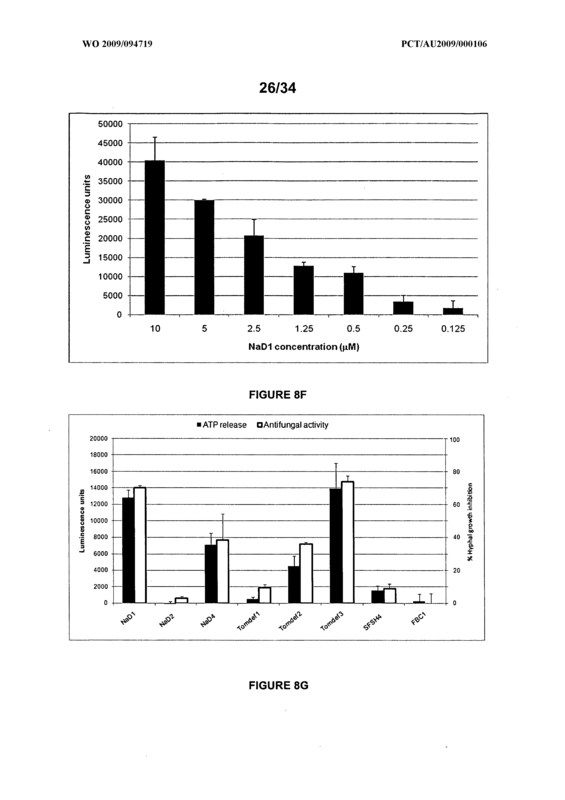 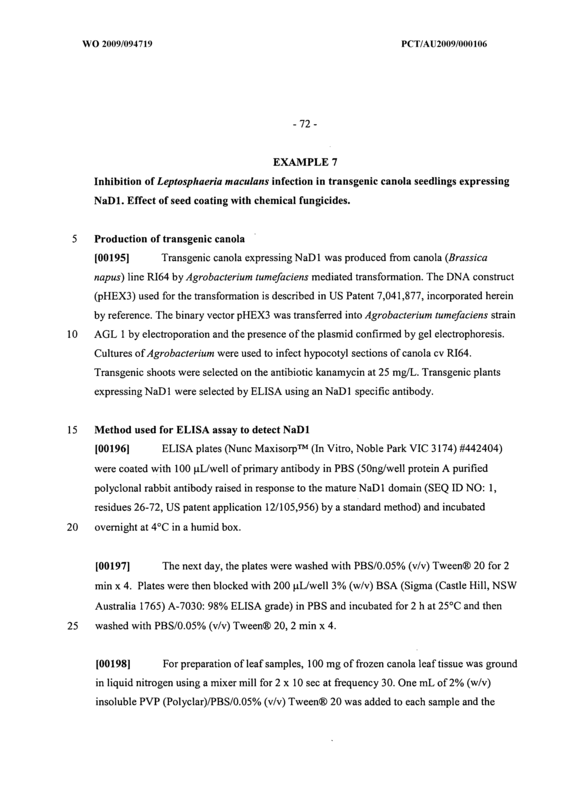 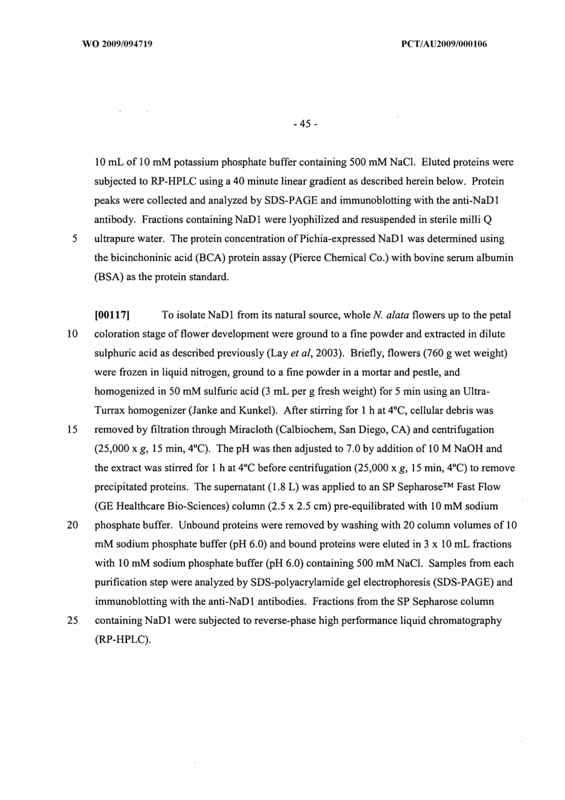 The method of Claim 21, wherein a defensin which enhances antifungal activity of a chemical fungicide is characterized by having a relative permeability index of greater than 0.12 on a scale where the permeability index of NaDl is set as 1.0. 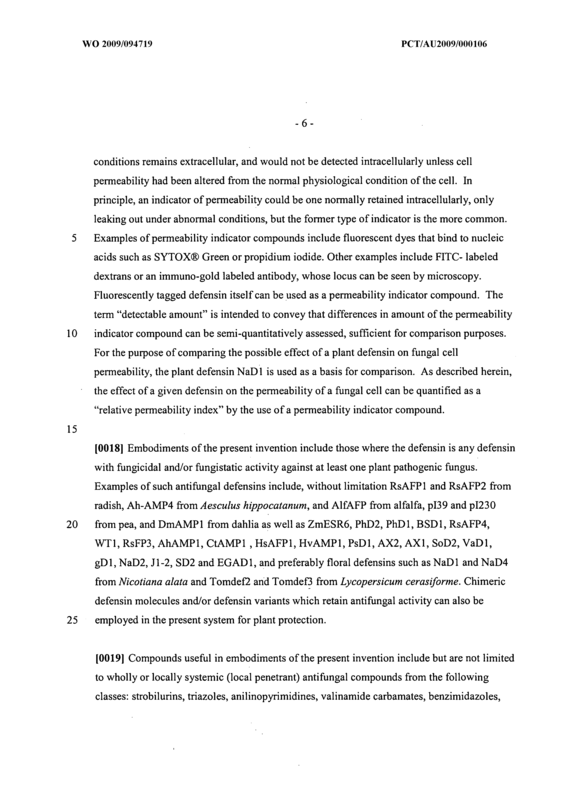 A defensin having a relative permeability index of greater than 0.12, as identified by the method of Claim 22. 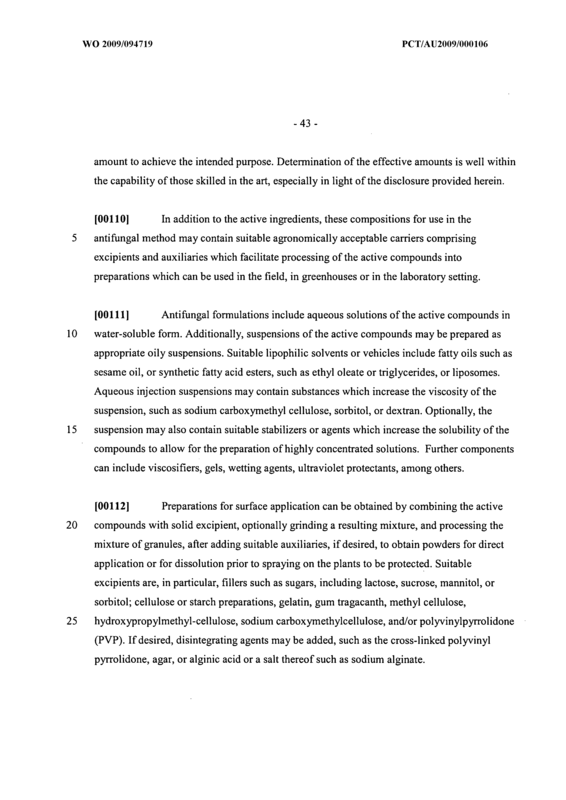 The method of Claim 16 wherein the permeability indicator compound is SYTOX® Green. 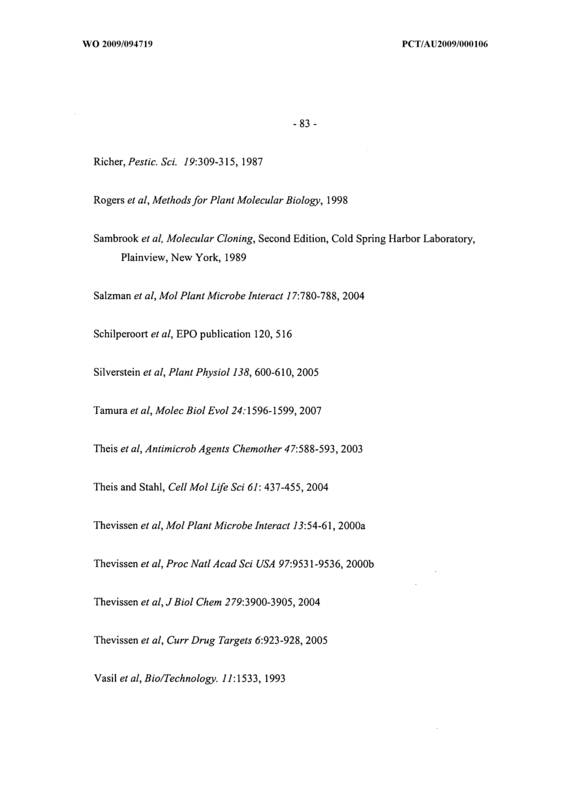 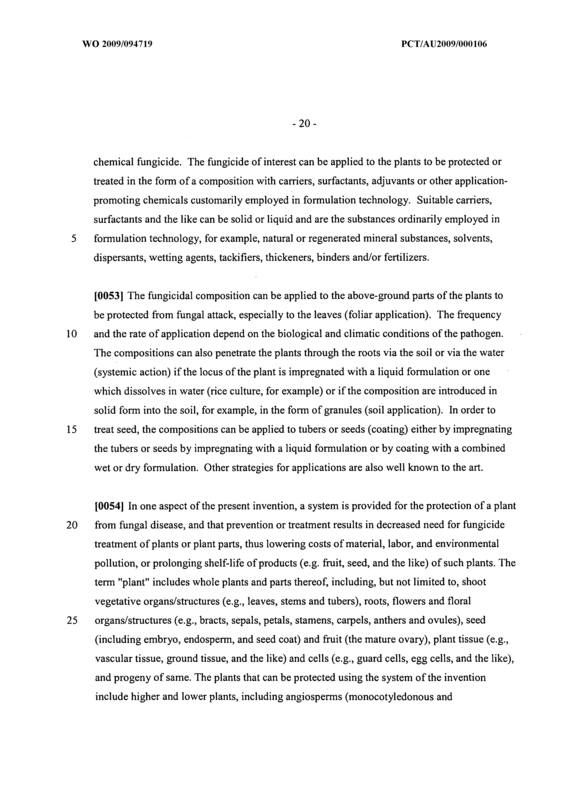 A system for protecting a plant from disease caused by a given susceptible fungus, comprising a first component and a second component, the first component being a chemical fungicide that is an inhibitor of said fungus, the second component being a plant defensin which is not in nature expressed by said plant, the plant defensin being identified by the method of Claim 21. 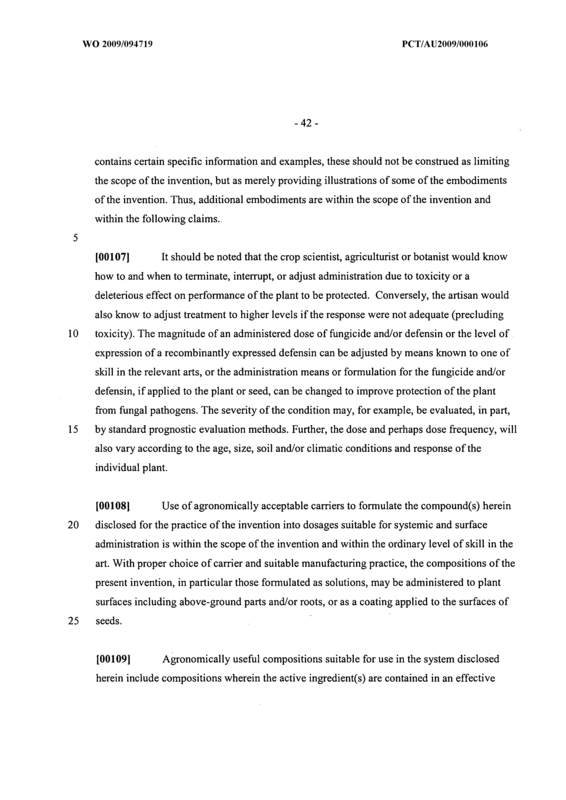 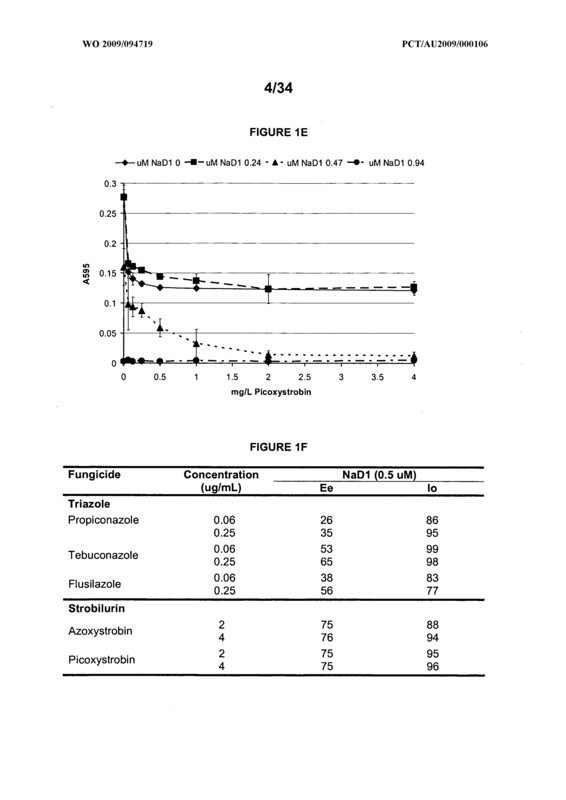 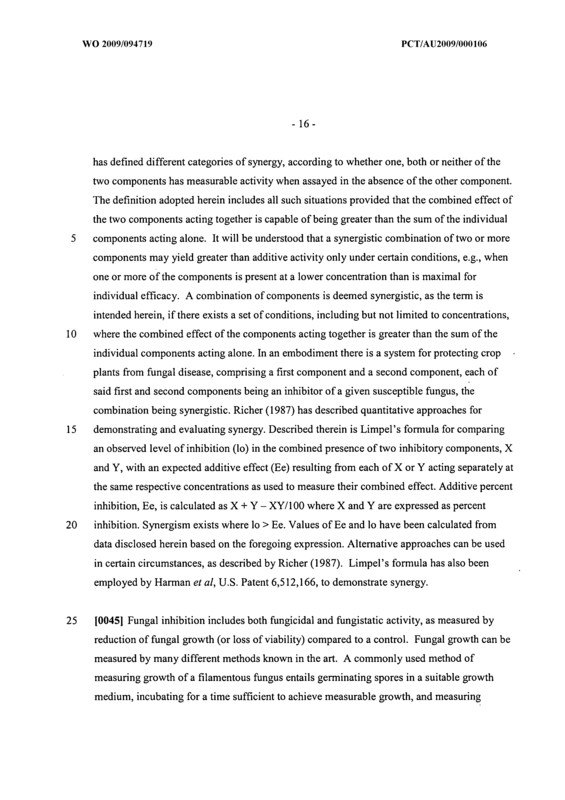 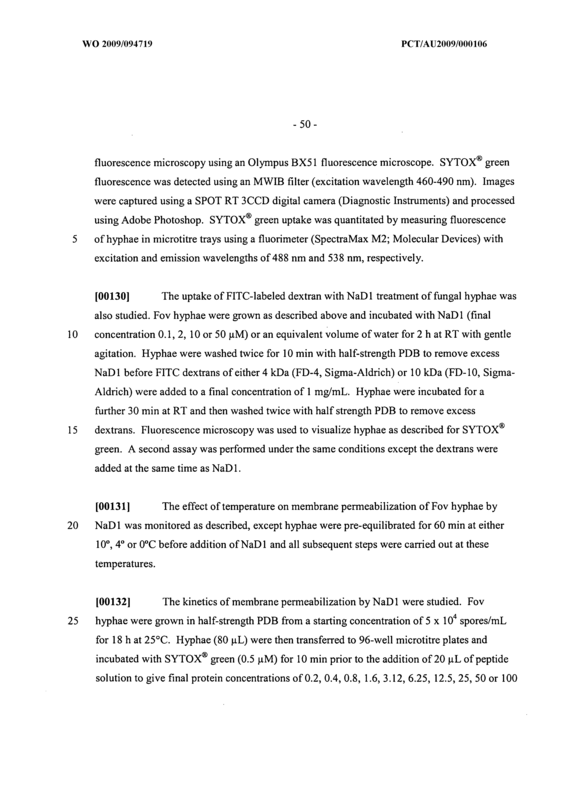 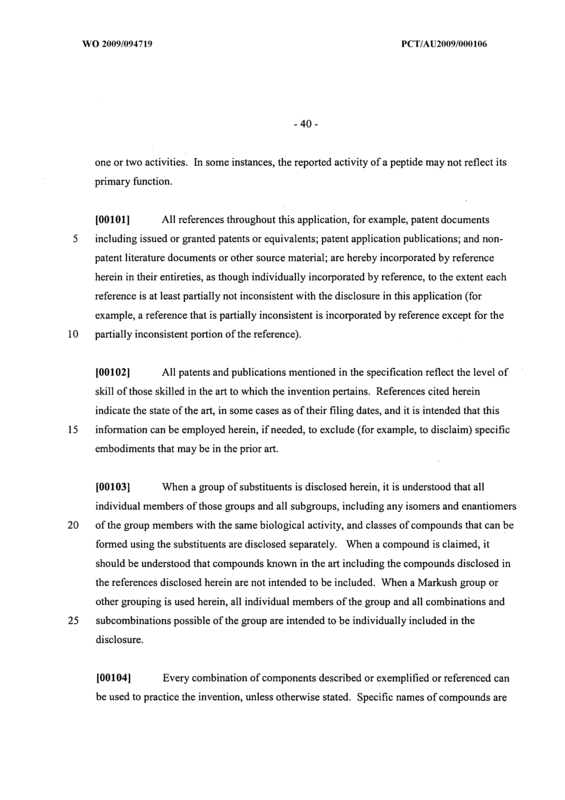 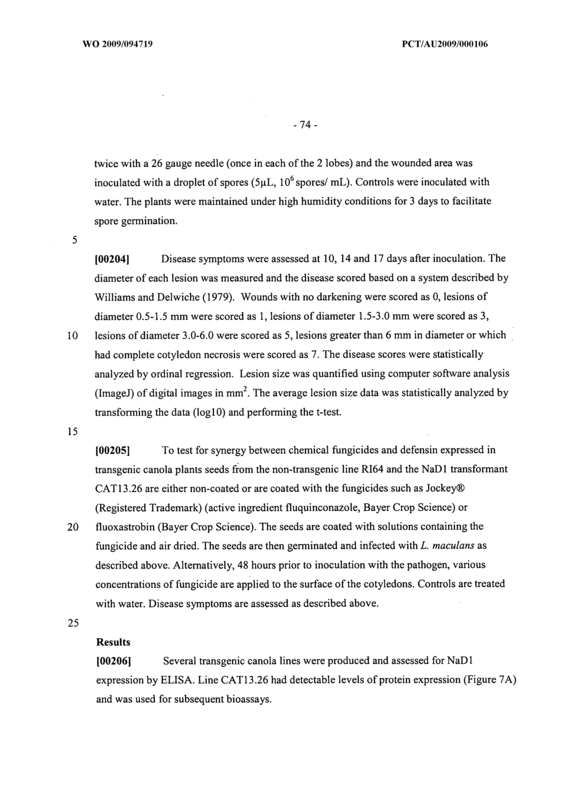 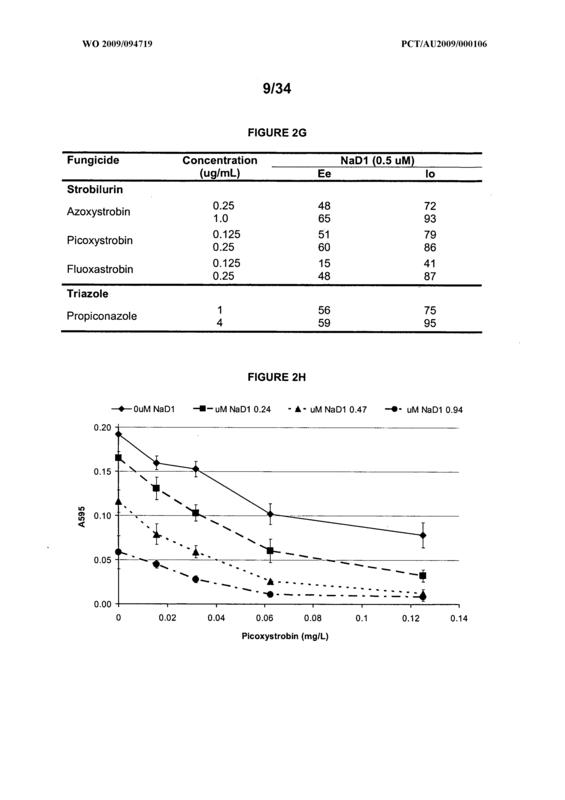 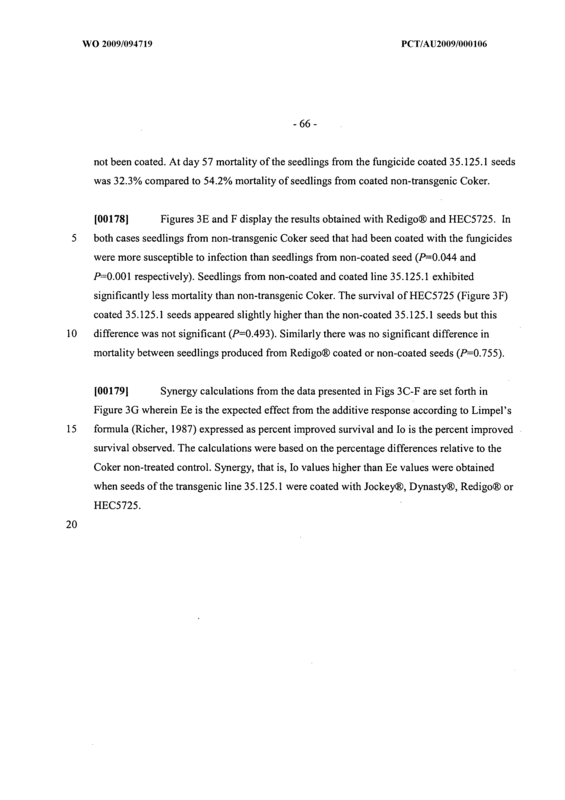 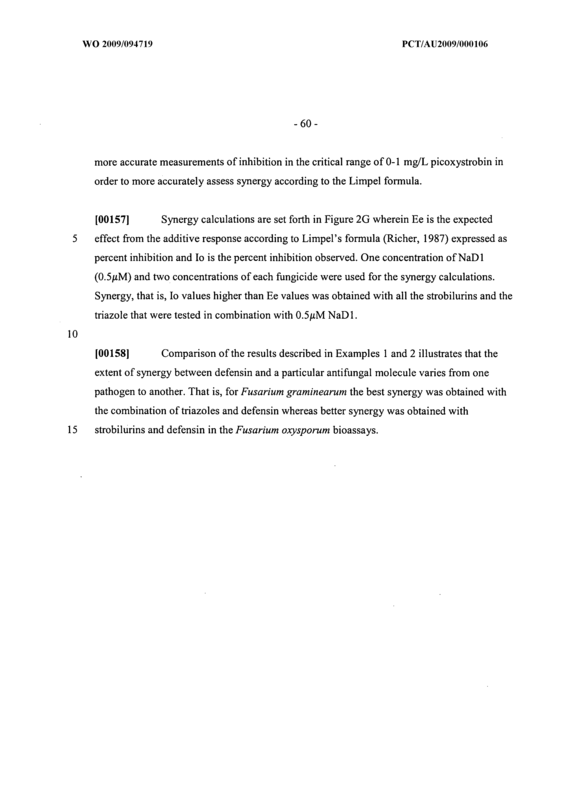 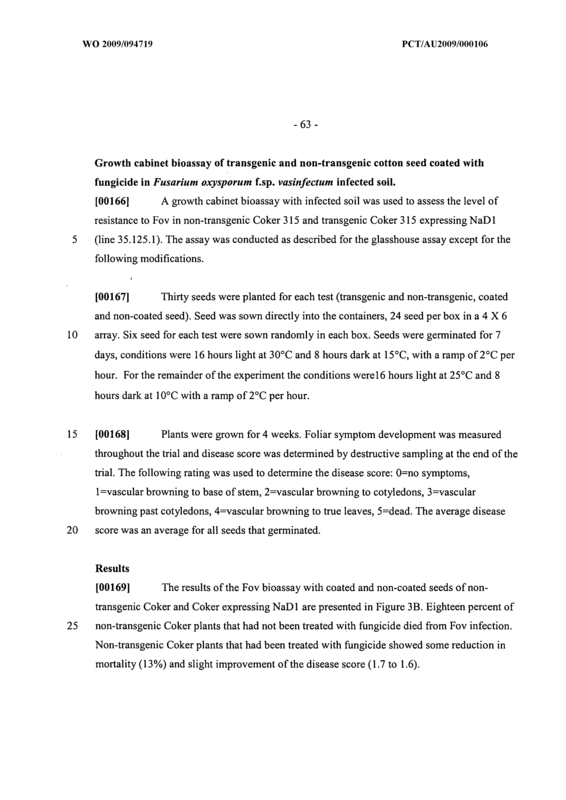 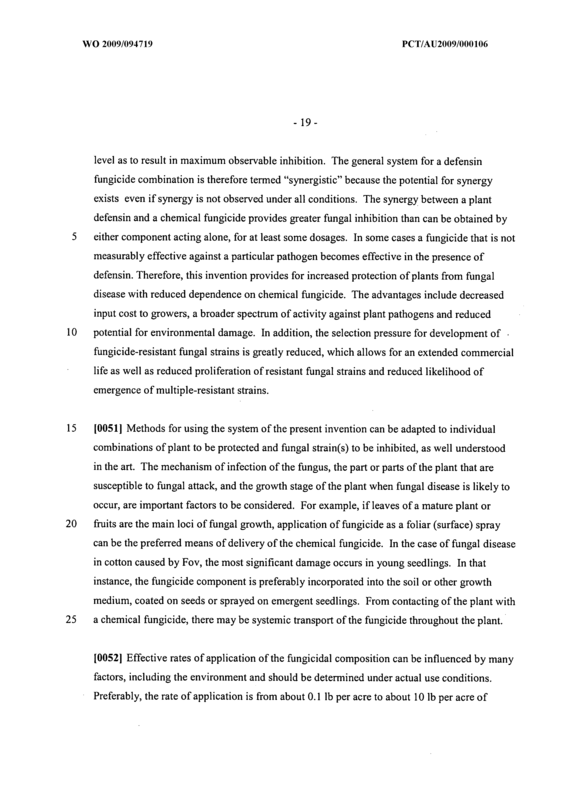 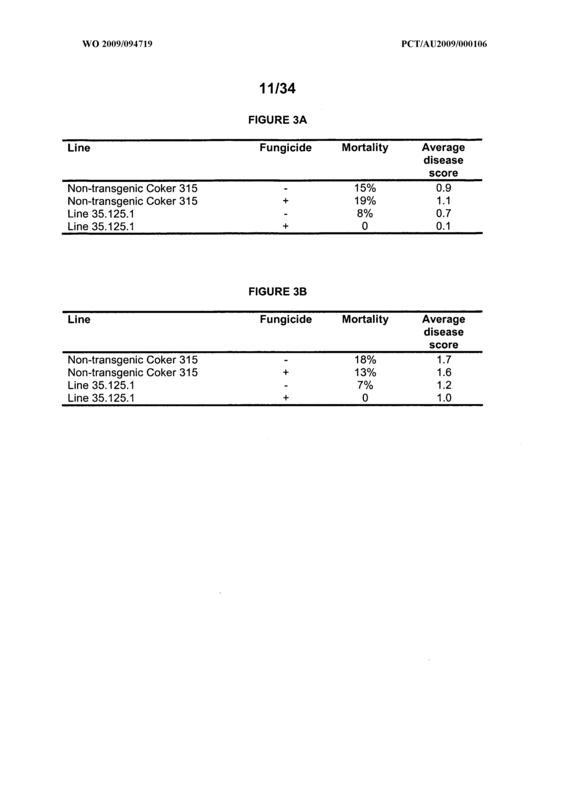 The system of Claim 25 wherein the extent of fungus inhibition provided by the first and second components combined in contact with the fungus being synergistic compared to inhibition provided by either component in individual contact with the fungus at the same dose used for the combined contact. 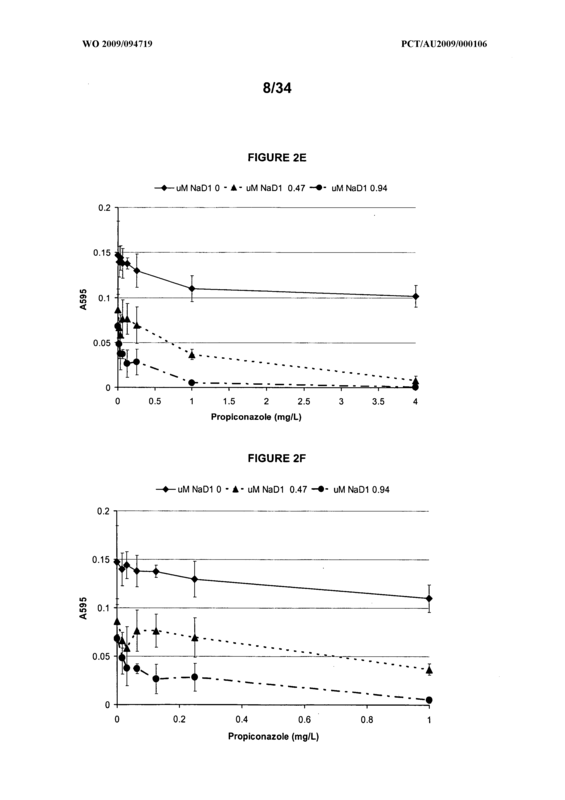 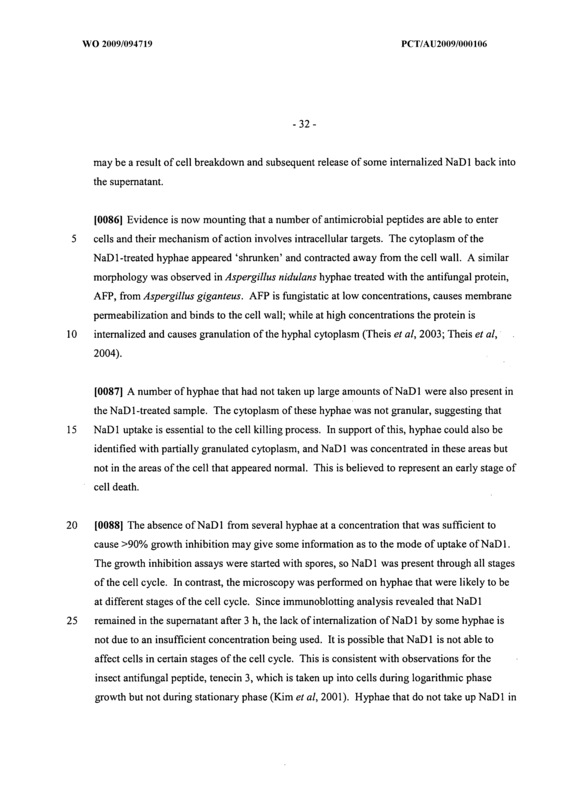 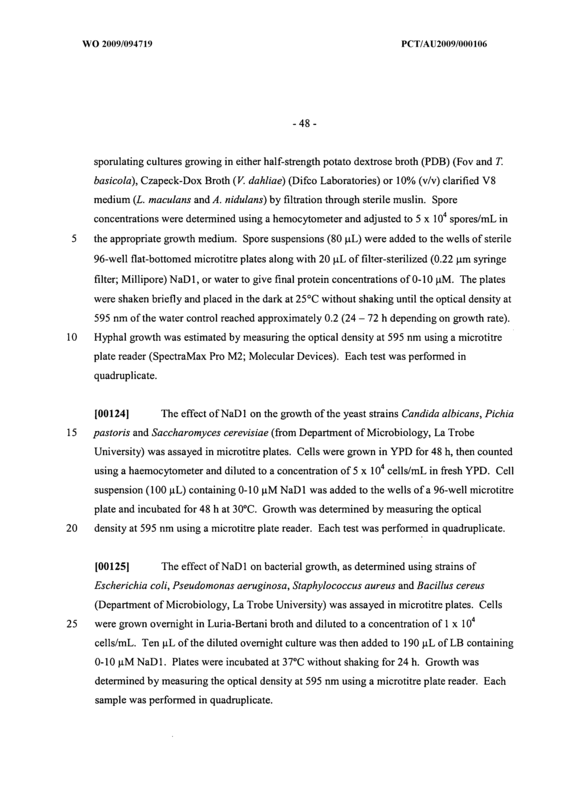 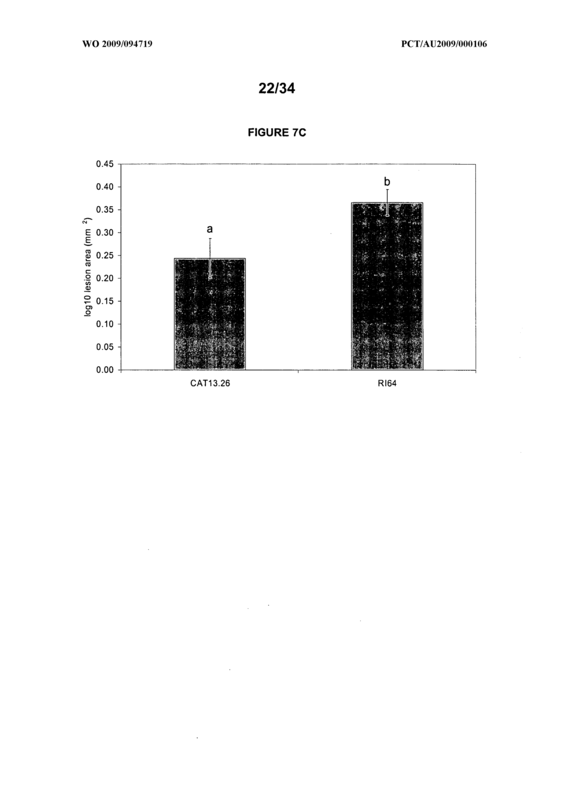 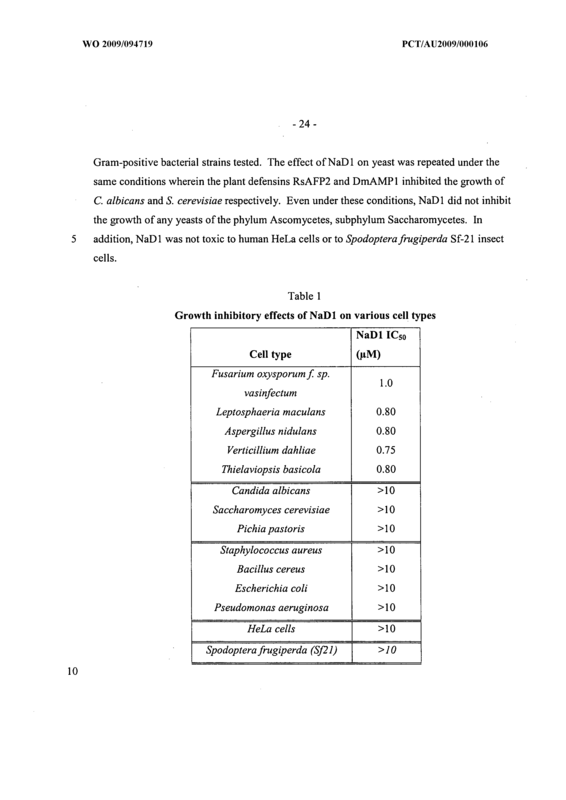 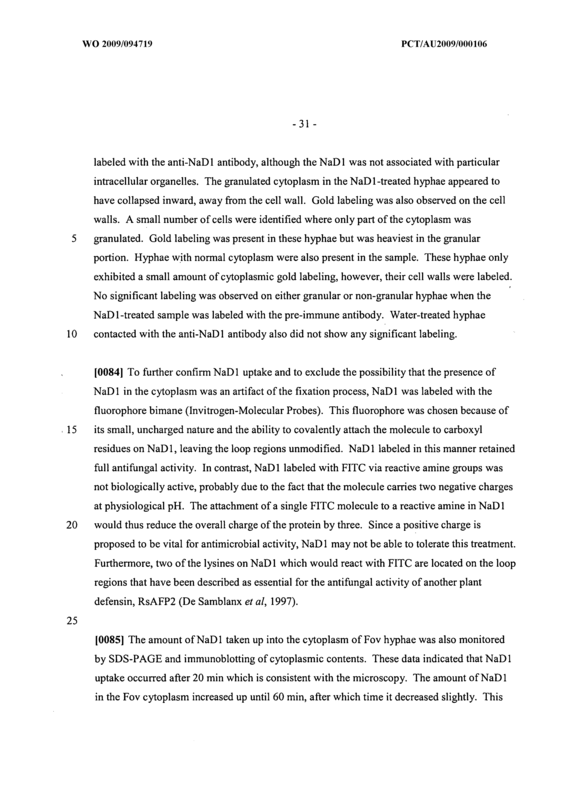 A plant defensin having the properties of NaD4 as described herein. 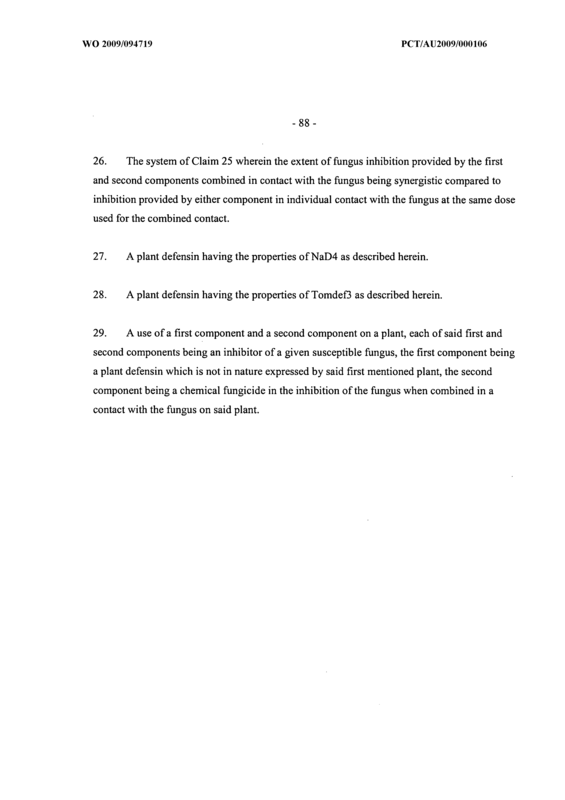 A plant defensin having the properties of Tomdefi as described herein. 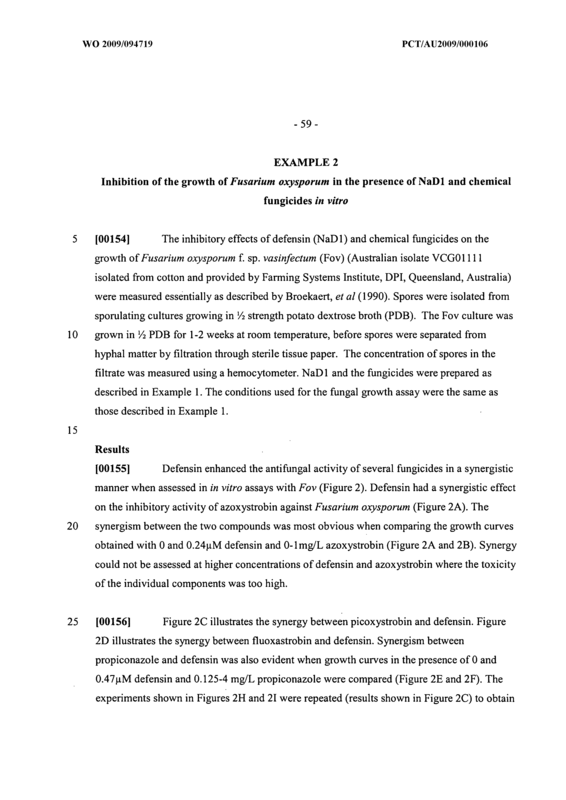 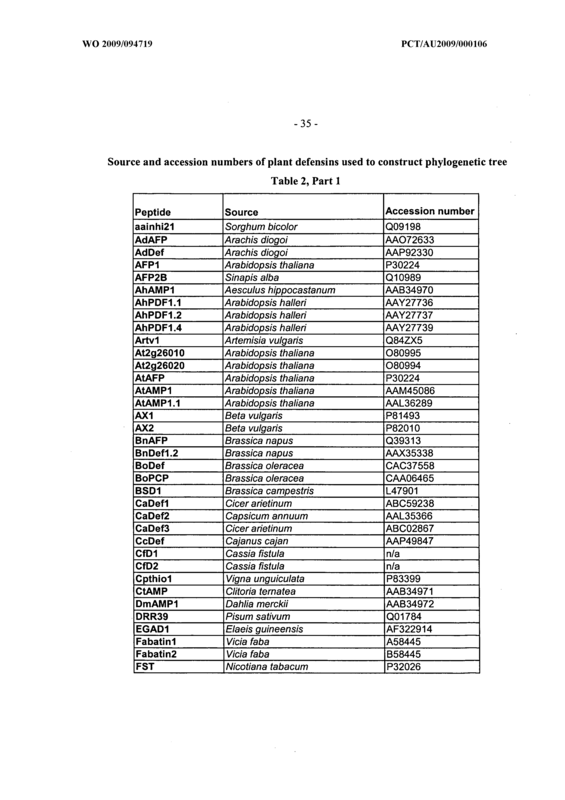 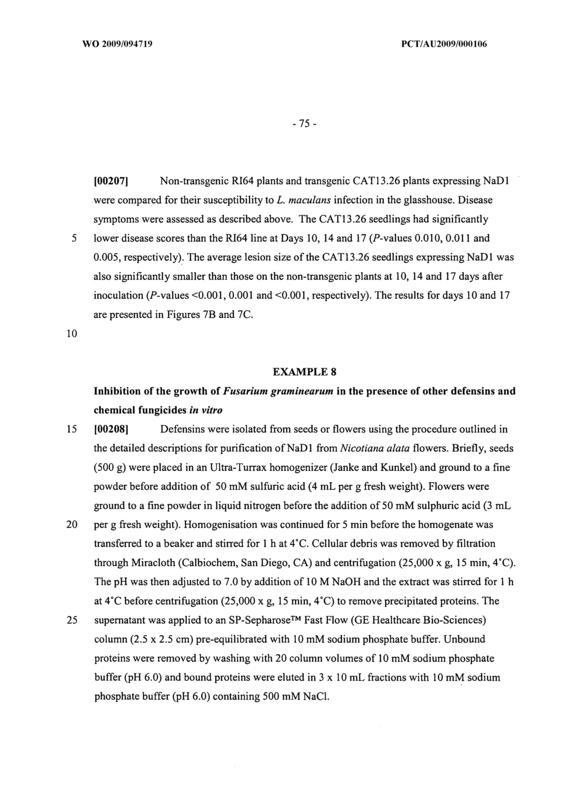 A use of a first component and a second component on a plant, each of said first and second components being an inhibitor of a given susceptible fungus, the first component being a plant defensin which is not in nature expressed by said first mentioned plant, the second component being a chemical fungicide in the inhibition of the fungus when combined in a contact with the fungus on said plant.